I’m back in Kyoto, and it’s almost midnight. I feel like I’ve returned back to my home after a holiday. I suppose because Mundo feels like a family, and I feel so welcome and comfortable here. Wow. 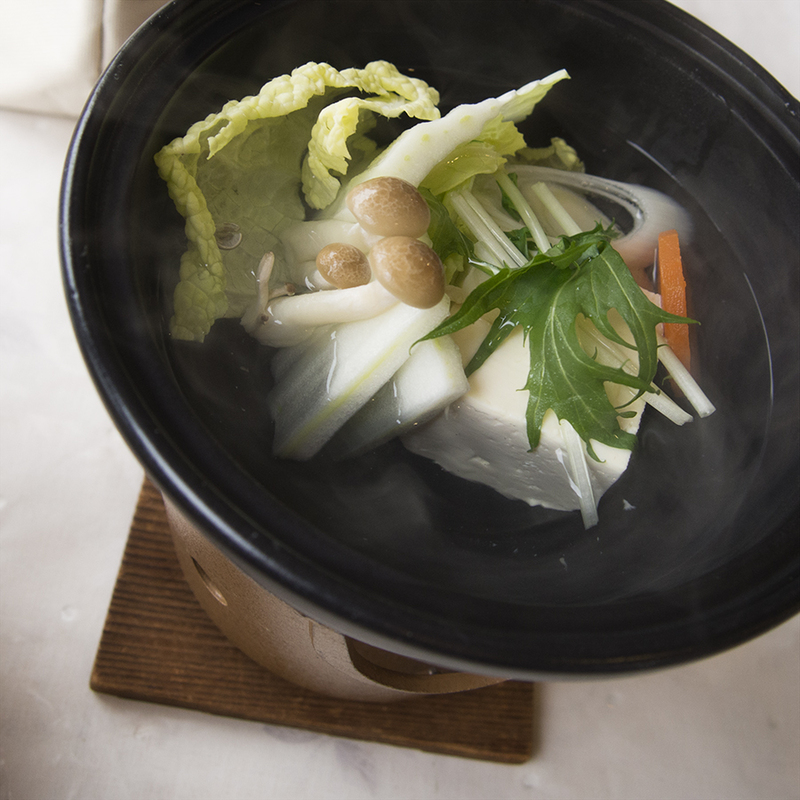 There was rice, a raw egg, nori strips, pickles, some niku-jaga made with naruto sweet potatoes, miso soup, grilled fish, some kind of roe with wasabi and spring onion, fish cake pieces, and some vegetables and tofu cooked in a little ceramic pot (which had a candle underneath that the waitress lit.) What a feast. I used the egg, rice and nori to make tomago-kake-gohan, which is raw egg and soy sauce on top of rice. Everything was really tasty, and I ate it all. I felt really full after, and had to sit for a little while before I could get up. I’m so used to having a light breakfast! After that feast, I checked out and walked along the river towards the station. The river was such a beautiful colour, and the water was flowing and rolling along at a gentle pace. Do you remember how when you were a kid, you would draw waves that squiggled gently up and down? That’s exactly how this river looked. It was so peaceful. The cherry blossoms were in full bloom, and their pale colours looked amazing against the colour of the water. It was impossible to capture on camera. At the station, I planned to buy a ticket for the bus to Kyoto, then do some souvenir shopping and perhaps visit Tokushima castle or Tokushima park, before getting the bus. But when I went to to ticket counter, the lady told me that the next bus was leaving in five minutes, and the one following that wasn’t until 3. I made the snap decision to get the one that left in five minutes, and have the whole afternoon in Kyoto to prepare for Kumano Kodo. I didn’t want to have to rush this preparation, because hiking in mountains isn’t something you want to do unprepared. So I jumped on the bus, which cost 4100 yen, and spent the next 3 hours watching the scenery change from seaside town to bustling city. I arrived at Kyoto station around 1pm, then walked back to Hostel Mundo, which took an hour. When I got there, everyone was glad to see me (especially the dog, Tida), and I spent some time chatting and sharing photos. The rest of the afternoon wasn’t very exciting, because I was just planning schedules and downloading five million maps about the hiking trails. Also booking a hotel in Osaka for the night that I would finish the hike. Real thrilling stuff. 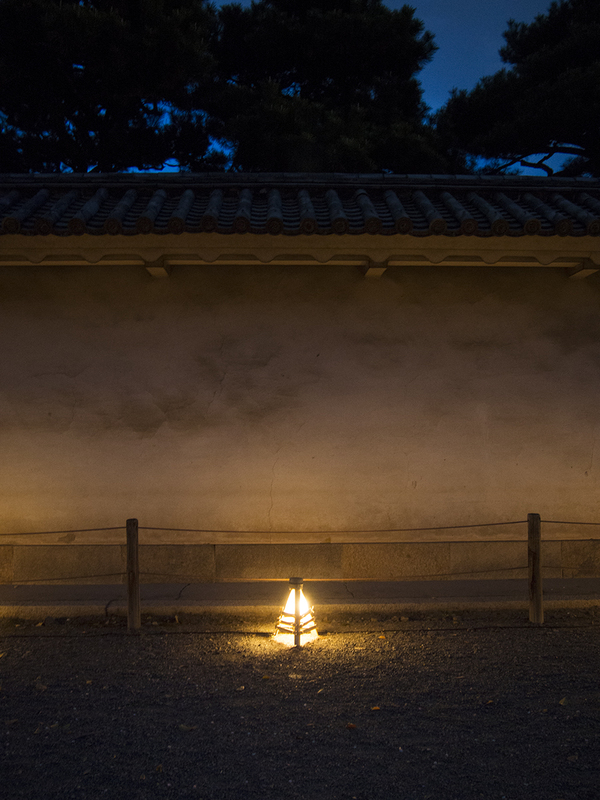 At 6pm, Kazuyo, myself, and another girl went to Nijo-jo to see it lit up at night. 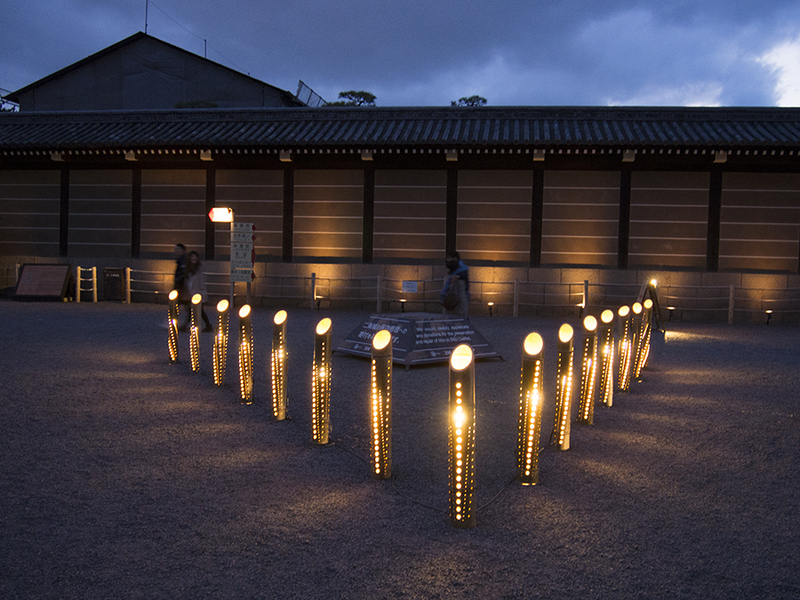 Around cherry blossom time in Kyoto, various temples and shrines hole this ‘Light Up’ event to show off the sakura. We bought tickets and went inside, where there was a route to follow which passed lit up bamboo totem poles, cherry blossoms, and other parts of the castle grounds. 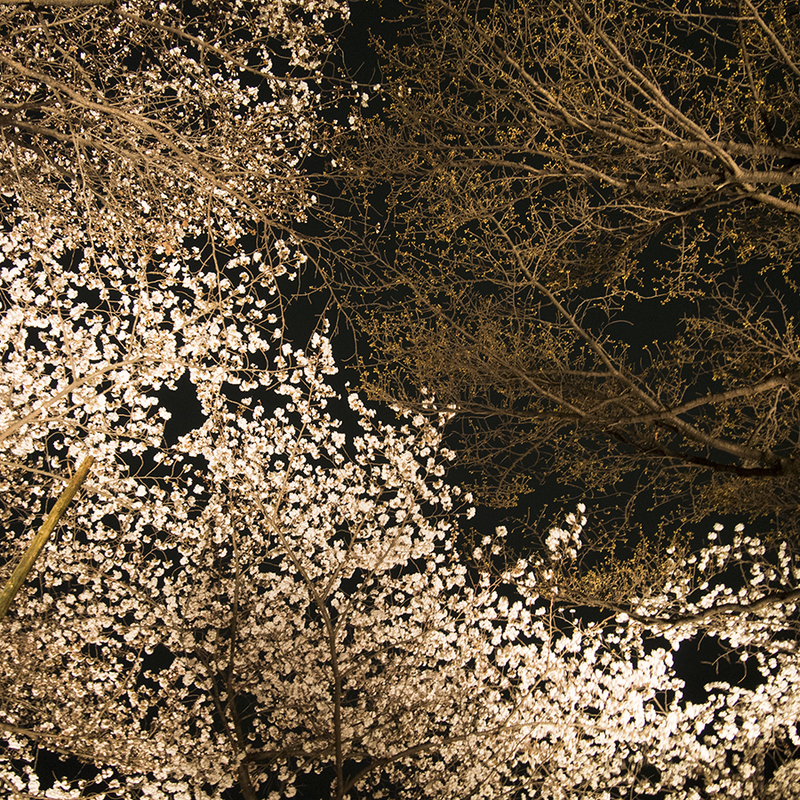 It was so beautiful, and I thought that the cherry blossoms looked like snow, or popcorn. 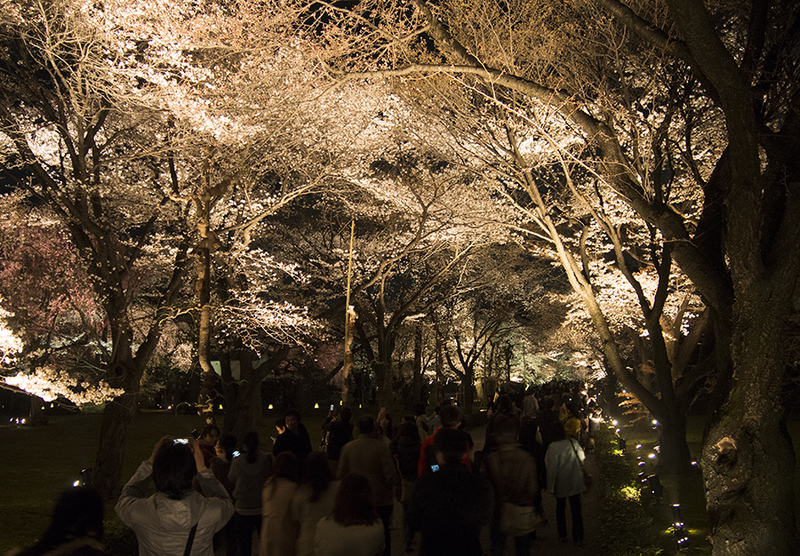 The best part was a whole tunnel of cherry blossom trees that was lit up. It was pretty spectacular. I can’t describe it in words, so here are some pictures. We stopped to buy food on the way home, then ate together in the common area. I had a salad, some bean and konnyaku things, some heated up burdock root dish, and two onigiri (one vegetable one and one yakiniku one.) Then I had some traditional Kyoto style sweets, which were awesome. Filled with anko, of course. Tomorrow I will head off on a 5 day hike through the mountains of Wakayama prefecture. The hike is a traditional pilgrimage route, and I’ll work for 6-8 hours each day. I won’t have internet access at all, so you’ll have to wait a few days for another blog. Wish me luck! My legs will probably fall off by day two, but we’ll see. 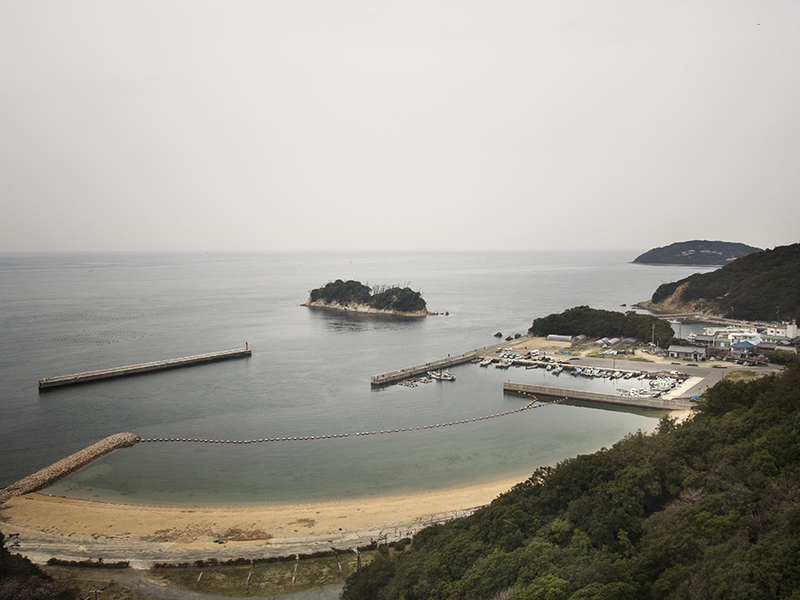 When I woke up this morning I still hadn’t decided what I was going to do in the few days after visiting Naoshima. I’d been thinking about it all night, and had a few different options in my head, but nothing locked in. I also had the problem of my heavy and inconvenient suitcase, which I didn’t want to take with me through the islands. I really should have through about all of this before yesterday. I thought about sending the suitcase somewhere, but I hadn’t decided where I was going to be, and hadn’t booked the accommodation to send it to. 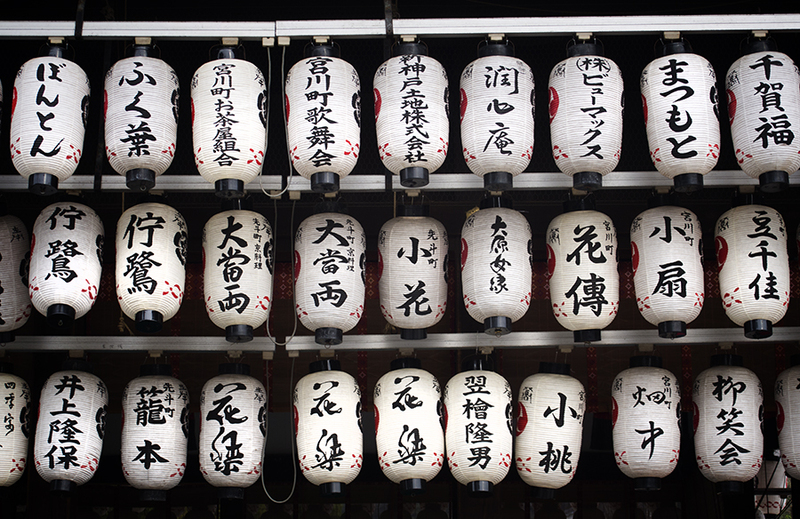 So then I thought that I could leave it in Kyoto, and come back for a night or two to collect it. This was just a thought last night, when I was feeling sad about leaving the Mundo family. 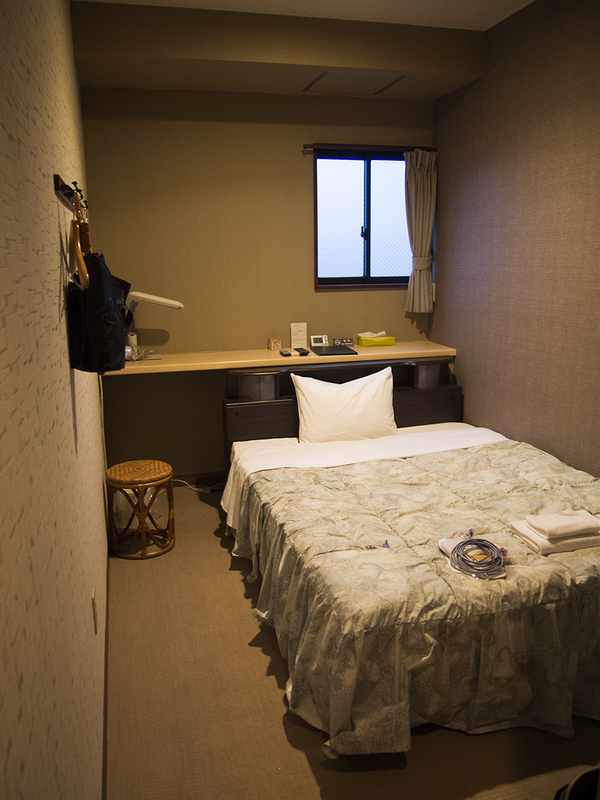 But I asked Midori if there was any vacancy on the 30th or 31st, and she said there was only one bed left on both nights. I had asked out of curiosity, but as the night went on, I liked the idea of returning more and more. When I woke up this morning, I knew that I wanted to return, so I booked myself back in on the 31st. It saved me having to worry about what to do with my luggage. After waking up and having breakfast, I packed my backpack with everything I would need for the next four nights, and then shoved everything else into my suitcase. Then I stored it underneath the stairs, and handed back the key to my room. I spent the next few hours sitting in the living room, trying madly to book hotels and work out a schedule. Tida watched me from the chair opposite, before falling asleep with his head on the arm rest. 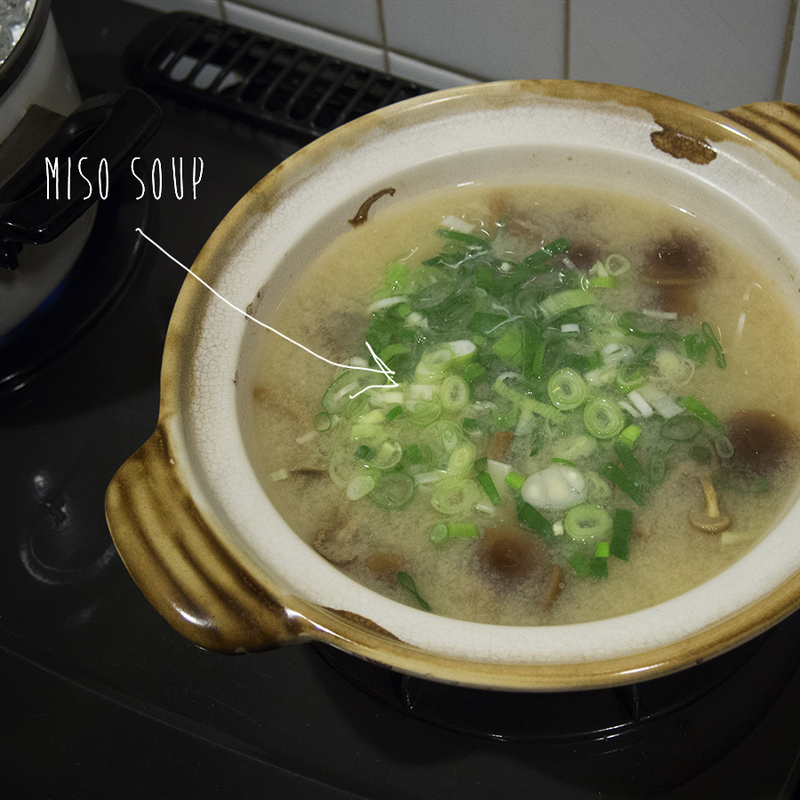 1pm came around quickly, and I ate some cabbage with sesame dressing, and a cup of mis soup for lunch. I really wasn’t hungry after yesterday’s feast, but I knew I should eat. Then I said goodbye to everyone and walked to Nijo station, where I drank a vegetable juice and got a train to Kyoto. At Kyoto, I switched to this really rapid train which took me all the way to a place called Aioi, at the base of many mountains. I was surprised that I could use this train with the 18 kippu, because it went so fast that sometimes my ears felt funny. 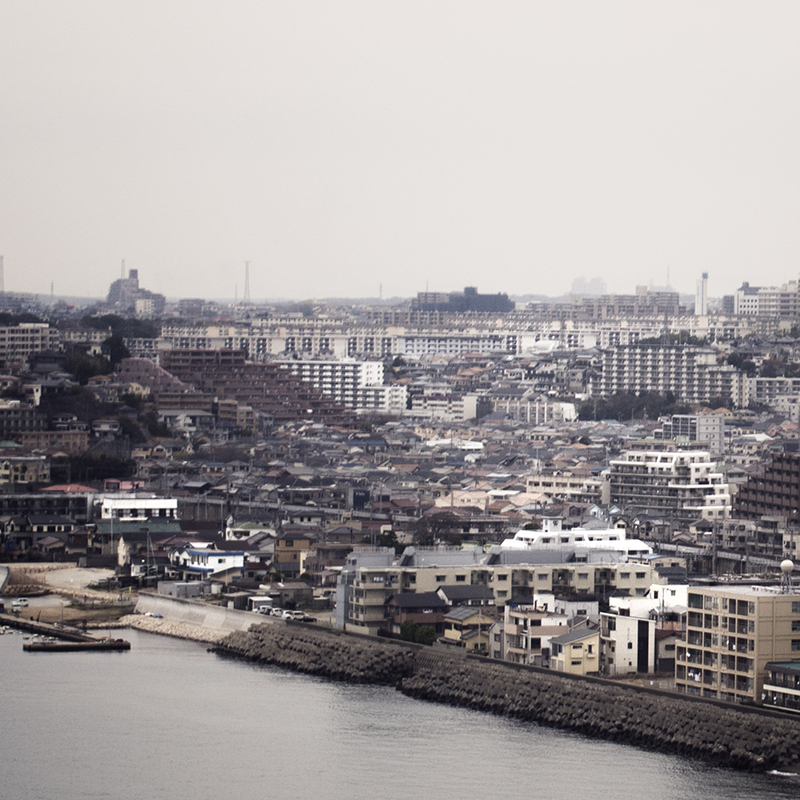 We passed Shin-Osaka, Osaka, and Kobe, and I stared out the window in awe when we passed by the inland sea. It was raining slightly, and everything looked pastel and blue. The sea and the sky merged together on the horizon, and deep blue silhouettes of boats dotted the water. 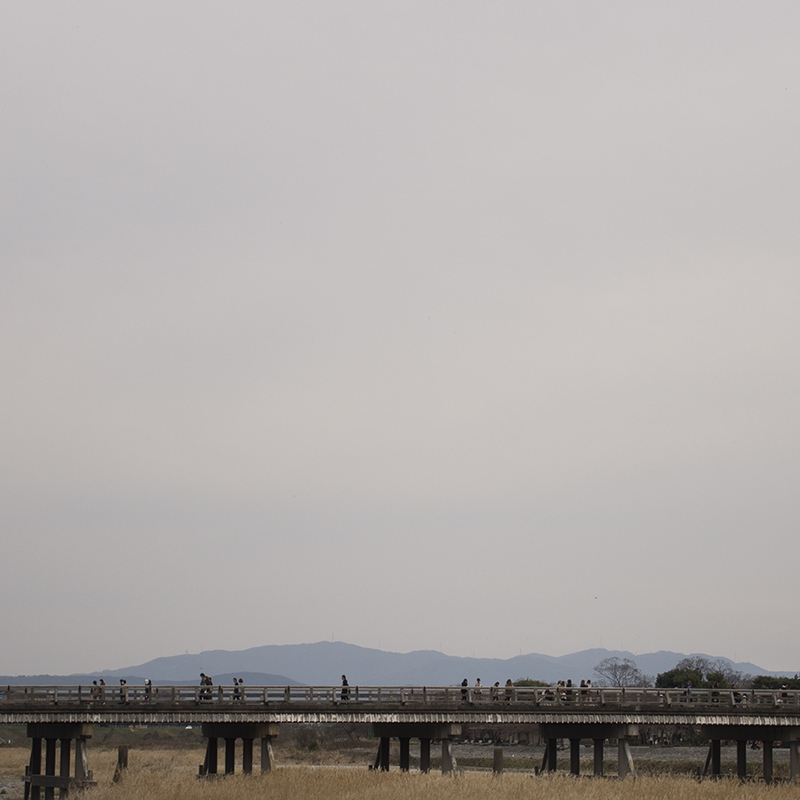 I saw the giant bridge that links the main island (Honshu) with Shikoku. Having read a lot about it, it was strange but also amazing to see it pass by on the train. I feel like such an old man saying that I enjoyed watching a bridge. Oh dear. At Aoio, I had to change to a local train for Okayama. This train was bright yellow, and stopped at every station. I took another hour to reach the station, but I really didn’t mind watching all the scenery go by. When I got to Okayama station, I realised that I had no idea where I was meant to go because I’d stupidly forgotten to screenshot the map of my hotel. Luckily, Okayama is a huge station, and it also had a large detailed map that listed most of the big hotels. But of course, my hotel wasn’t on there. It was called ‘Hotel Riverside,’ so I assumed that it was near some kind of river. But the river looked really far away from the station, and I didn’t think that I would have booked something so far away when I was only staying one night. Puzzled, I studied a few more maps, just incase they had forgotten to put it on the first map, but there was no sign of this hotel. I thought that maybe I’d reserved a room in a hotel that didn’t exist. Then, in my most brilliant move yet, I had the bright idea to visit the tourist information centre and ask if they knew where it was. Surely they would have heard of it at least once or, at the very least, would have the internet so I could look it up. It took me a while to find the tourist info centre, because it was tucked away in the corner of an underground shopping mall. Inside, the two ladies at the desk were really helpful, and knew exactly what I was talking bout when I mentioned the name of the hotel. They drew a little route on a map for me, and spent about ten minutes explaining over and over how to get there (the directions weren’t hard; I only had to turn once.) I thanked the, and made my way to the station exit, where it was raining and misty, and starting to get dark. 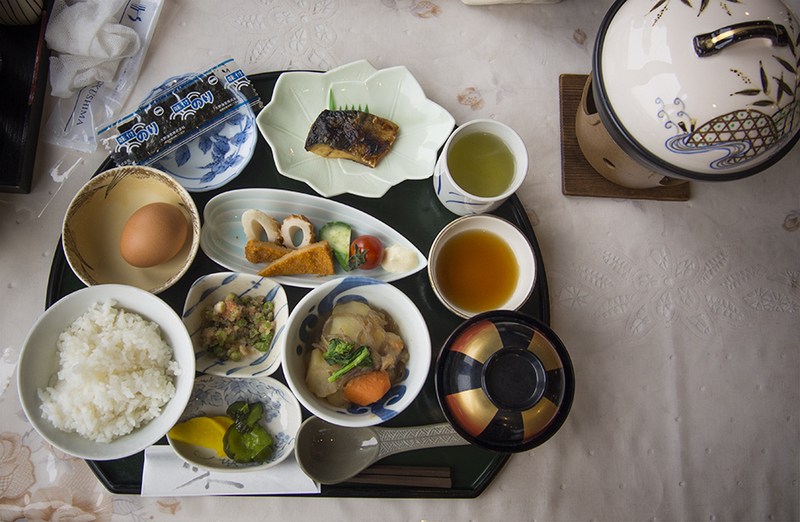 Okayama is much colder than Kyoto, which made me wonder if I’d brought enough clothing for Naoshima island. I found the hotel really easily, and it only took about 5 minutes to walk there. I was really glad I’d brought an umbrella with me, because it rained constantly the whole time. But the rain was gentle and calm, if that makes sense. I didn’t mind it, and it didn’t make me frustrated, just happy. The hotel did end up being near a river, but not a real river. There is a tiny canal that runs down the length of the street that the hotel faces, hence the name ‘Riverside.’ I checked in with no hassle, and was given a special ‘ladies pack’ which included all the essentials for the female human. Things like a comb, shampoo, and a little scrunchie. There is a big bath and sauna complex in the hotel, but only men are allowed to use it, so I guess the ladies pack is the compensation for being female. The room was clean and neat, and looked pretty modern, despite the slightly seedy appearance of the hotel’s lobby. I dumped the heaviest of my stuff, but wasn’t brave enough to leave my laptop or anything valuable in the room. Then I walked around the streets for a while, looking in a few stores and checking out which places looked tasty for dinner. I was looking at the menu of a ramen shop, when this gross began looking guy came out and said to me (in a dirty Australian accent) “its ramen. Like, noodles. It’s the bloody best one in the whole town.” That pretty much consolidated that I was not going to eat there. I found a place that served a bit of everything, including bibimbap, which I felt like, but the wait was 30 minutes, so I decided to find somewhere else. I was hungry, from not really eating a proper lunch, and felt like lots of food, fast. Across the street there was a little izakaya called Daruma, and I headed inside and was seated at the bar. This was great because I could see into the kitchen and watch the guys preparing food. One guy was working over hot charcoals, pumping out delicious yakitori and tending to the flames. It smelled amazing. 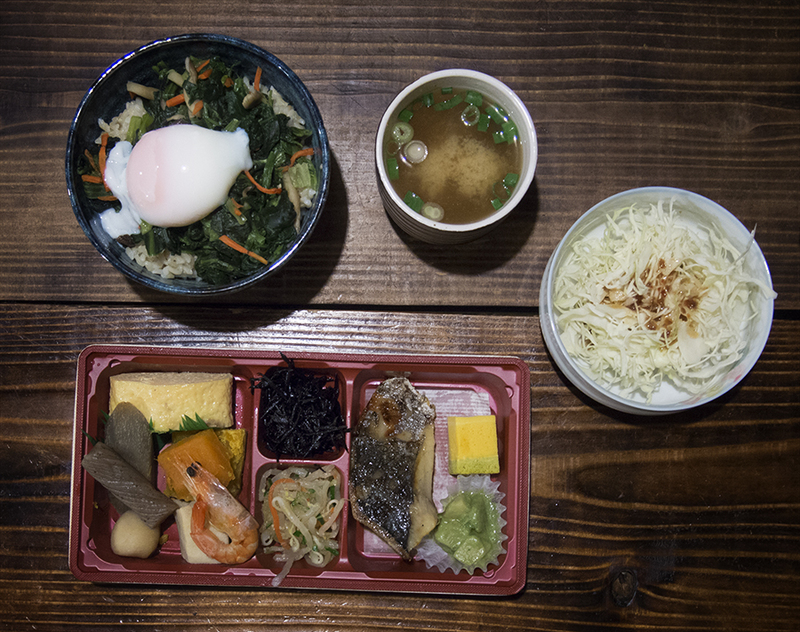 I ordered a bunch of dishes, which were all cheap, and sat back to enjoy the atmosphere. The place was multi story, and most people were upstairs, so it kind of felt like I had the whole place to myself. The dishes came out one by one, and I demolished them straight away. I had chicken and leek yakitori, shiitake yakitori, a Caesar salad (Japanese style) which had a soft egg on top, and some special vegetable and chicken rice cooked in its own pot. Everything was pretty tasty, but the salad was swimming in dressing. 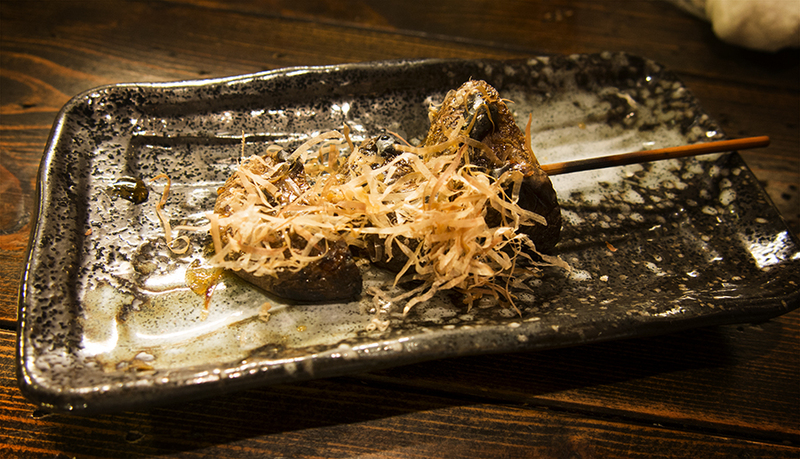 The best was the yakitori. After dinner, I was still hungry, but I couldn’t be bothered waiting for food to be cooked because I wanted to go to sleep. So I went to a convenience store and bought a little vegetable dish with 10 kinds of vegetable inside, and a chicken onigiri. 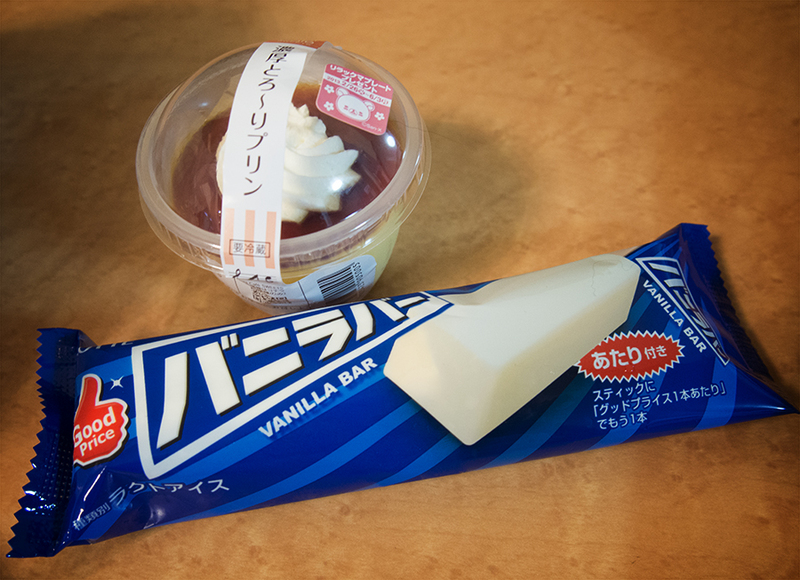 I also got a little pudding and a 60 cent ice-cream bar which I ate back in the hotel. I used the downstairs LAN internet for a while, and I could see all the other guests in the hotel looking at me when they thought I wasn’t looking. It was like they’d never seen a girl before. I suppose the hotel does cater more towards men, but still. It was kind of weird. Back in the room, I had a shower, and it was kind of nice not to have to wait and then race in when there was a free space. I had planned to go to bed early because I have a full day of activities tomorrow, but when I got in bed I knew I was going to have a crappy sleep. You see, the bed was catered more towards people who enjoy having metal springs poking between their rib cages. I could feel every single coil in the mattress, and there was nowhere on the bed that I could escape them. Ahh the joys of travelling. I must have been truly exhausted last night, because I fell asleep immediately and didn’t wake up until 8:30. It was oddly quiet this morning, probably because the loud and annoying Phillipino people checked out already. Despite having the most solid sleep I’ve had in a week, I still felt tired and,my body felt like a bag of bricks. I guess that’s all the walking and cycling catching up with me. I had breakfast and got ready, then set out for a flea market that the girls last night were telling me about. I wanted to get a coffee from this cafe I saw yesterday, but it was closed. So I got a chilled one from Family Mart. Like I keep mentioning, it’s becoming an addiction. I walked to the temple where the market was held, and was surprised at how big it was. It completely covered the area in front of and next to the temple grounds, as well as spilling out into the streets. The vendors were selling mostly antique things (crockery, kimono fabric, bags, that kind of thing), but there were also some pickle and vegetable sellers thrown in for good measure. One side of the market was great, but the other was kind of tacky, packed with carnival style games and fried food stalls. After looking around and debating whether or not to buy a hand carved wooden bento, I walked back towards the main river in Kyoto, to a station called Demachiyanagi. This station is the terminal for a special train that goes up into the northern mountains of Kyoto. 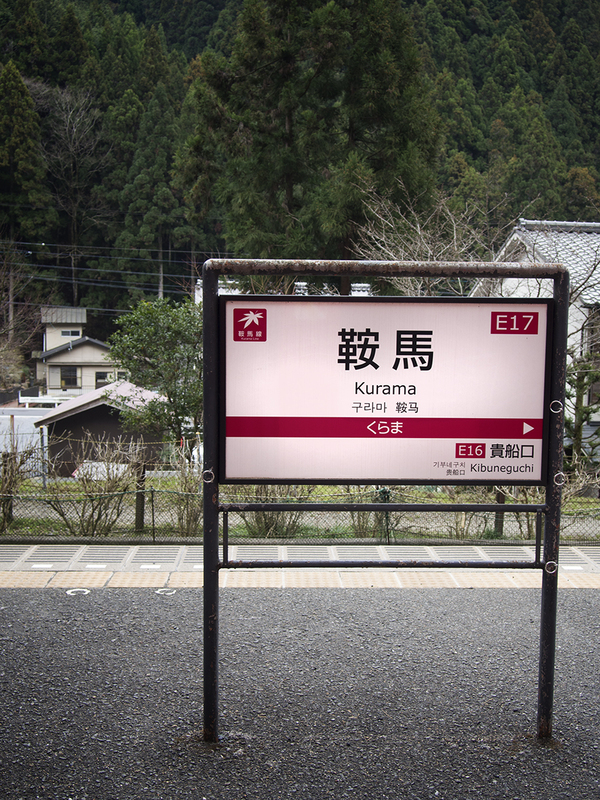 There are two main towns that are accessible from this train; Kibune and Kurama. 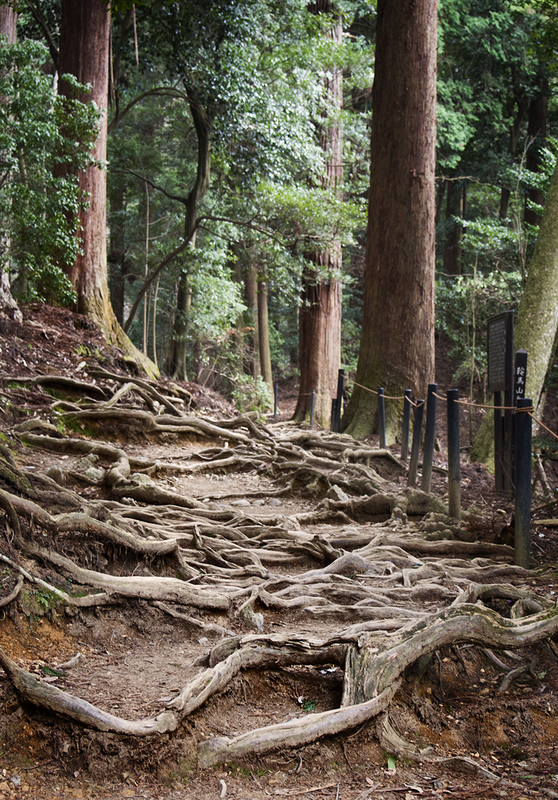 It is popular to hike between the two towns via a special route that passes through forest and temples. This is what I planned to do. So I took the train up to Kibuneguchi, where I would start my hike. It was a funny little train. It was two cars long, and had different kinds of seats inside. There was a row of single seats, some pairs of seats facing each other, and some bench-style seats facing the window for your viewing pleasure. 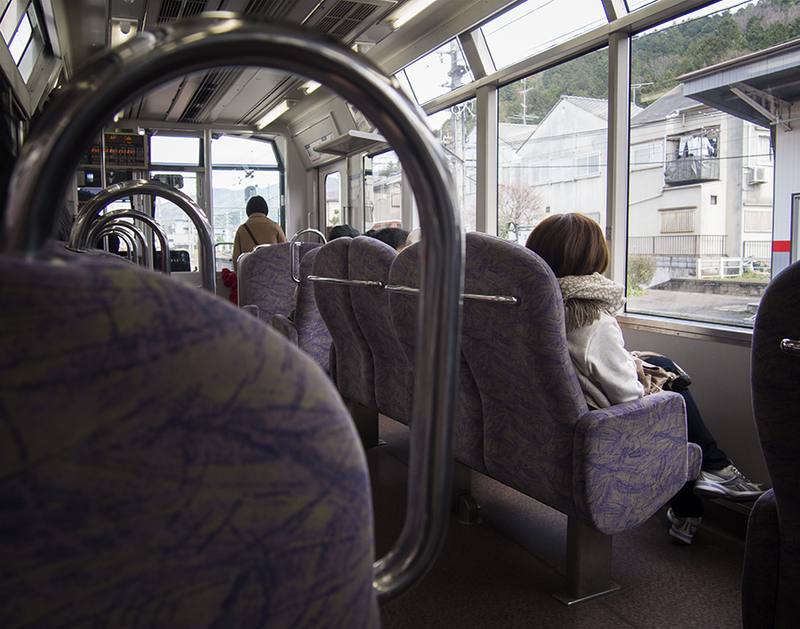 The train slowly made its way toward the mountain, with voice-overs every 20 seconds that said the name of the next station, and continually thanked everyone for using the train. It said everything in Japanese and English, but the English voice was really slow and annoying. It spoke English as if it was speaking to a non-English speaker. I felt like the voice was being intentionally patronizing. The train arrived at the station and I got off and collected a free map. I was a bit disoriented, and there was nothing around, so I wasn’t really sure where I was meant to go. I knew that I could either take a bus to the main part of Kibune town, or walk for about 20 minutes. I could see the bus stop, but I wanted to walk, so I studied the map and eventually worked out where I was meant to go. 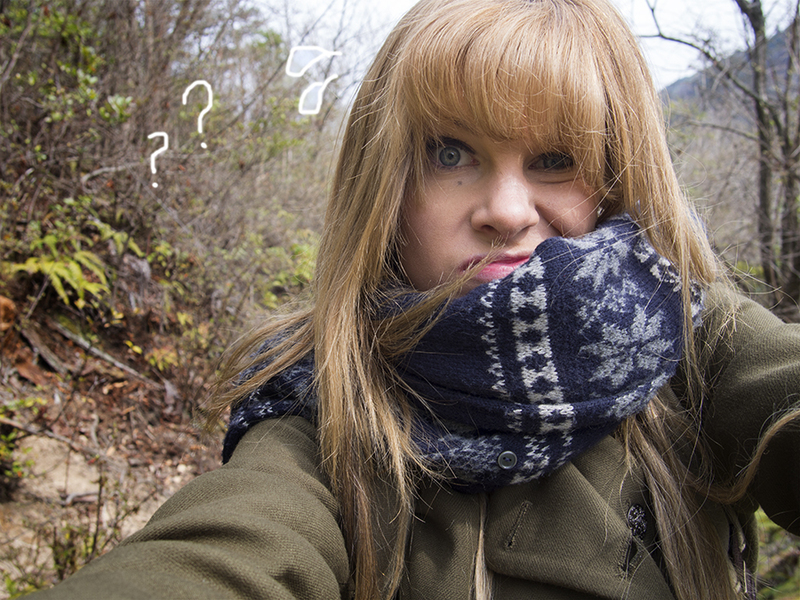 It was much colder up in the mountains, and I wondered if wearing shorts was such a good idea. I had been walking for about 5 minutes when it started to rain. Not heavily, just a shower, kind of. Just my luck, I thought, but it didn’t last very long, and I didn’t get very wet. The walk to the town took 20 minutes, as expected, and was just along a paved road that wound around the hills and followed the river. I was amazed at how tall the cedar trees were, and how clear the river’s water was. 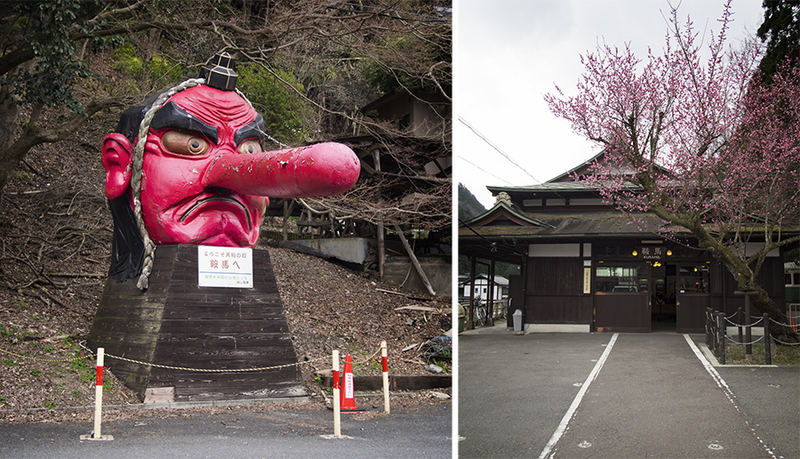 The town wasn’t really much of a town, more of a small collection of noodle restaurants and a shrine. And, being Monday, most things were closed. It started to spit again, and I sheltered underneath an overhanging roof to eat lunch. There was a bench there, which belonged to a restaurant that wasn’t open, so I sat on that. 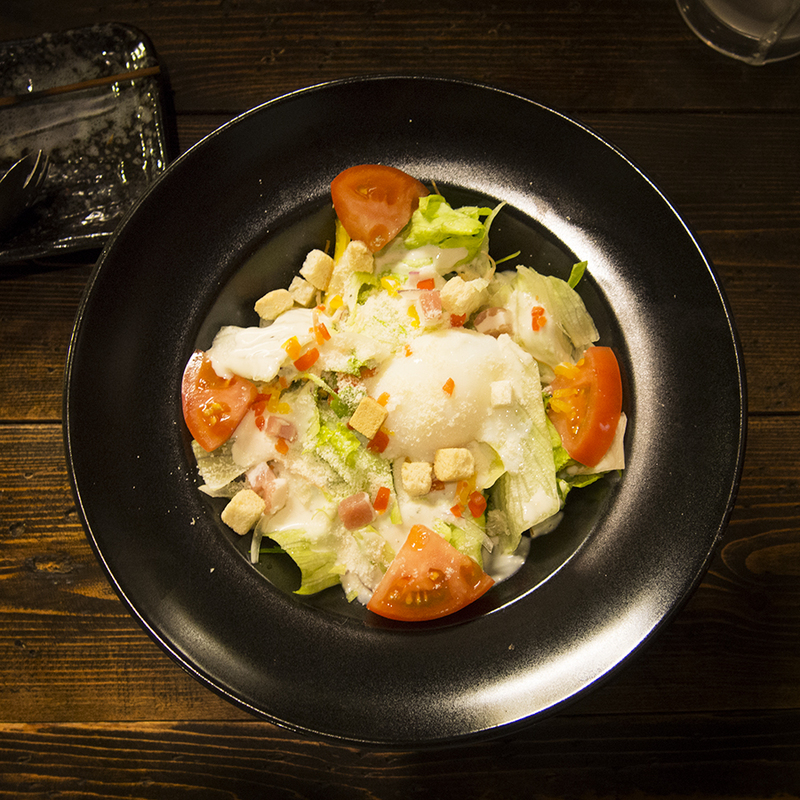 I ate a new kind of salad, with sweet potato, walnuts, pumpkin, hijiki and burdock root mixed in with the salad. And I had an ebi-may sushi roll, which I am now a pro at unwrapping (it’s tricky the first time because they are always wrapped so that the rice and nori don’t touch.) Then I was still hungry, and wished I had brought another onigiri as well. I thought there might be yaki-mochi vendours or homemade onigiri stalls in the town, but there weren’t. I did, however, come across a guy selling all kinds of daifuku, so I bought one that was famous in the area, which was brown and filled with tsuba-anko. Super tasty! 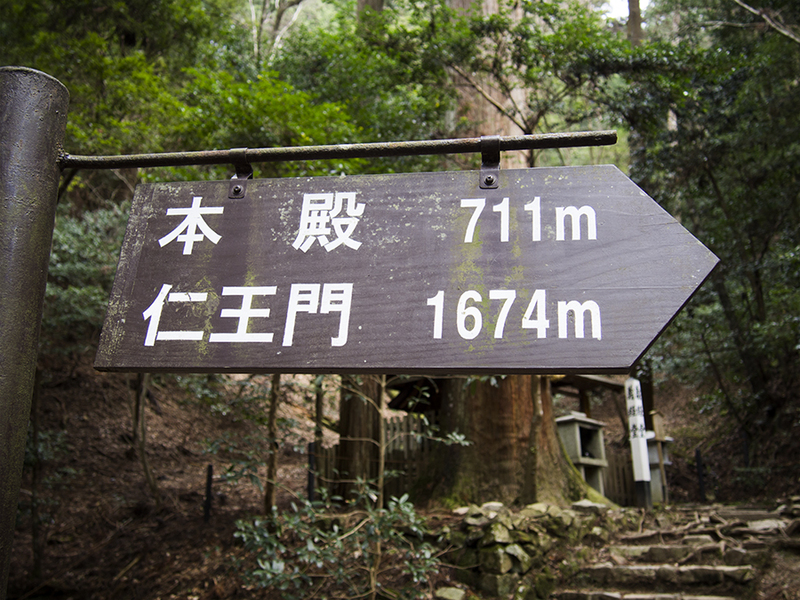 1915 meters to the main gate at Kurama. That doesn’t sound that far, but you have to remember that this is a climb, not a paved, flat path. I just kept thinking of my grandfather, and how he would be proud if I finished all these hikes that I set out to do. I also thought of my dad, and how he’d want me to keep going and do my best, and never give up. I make it sound like the hie was impossible, but really it wasn’t that bad. The first bit was steep, but only enough to make my heart rate rise, not enough that I needed climbing picks and ropes. Don’t get the wrong idea here people. The next section of the course featured a whole heap of tree roots, all over the ground. They were incredible, and looked like a maze. Some parts were really smooth, from being stepped on over and over again. I really had to watch my footing because the roots were really uneven, and some were quite high. The root forest led to another small shrine, and then I had to climb about 400 stairs (steep ones), which seemed to go on forever. I passed a lot of people, all going in the opposite direction to me, of course. I had only gone up, so I thought maybe I should have started from the other end of the course, because it might be easier. Oh well, I liked the challenge. 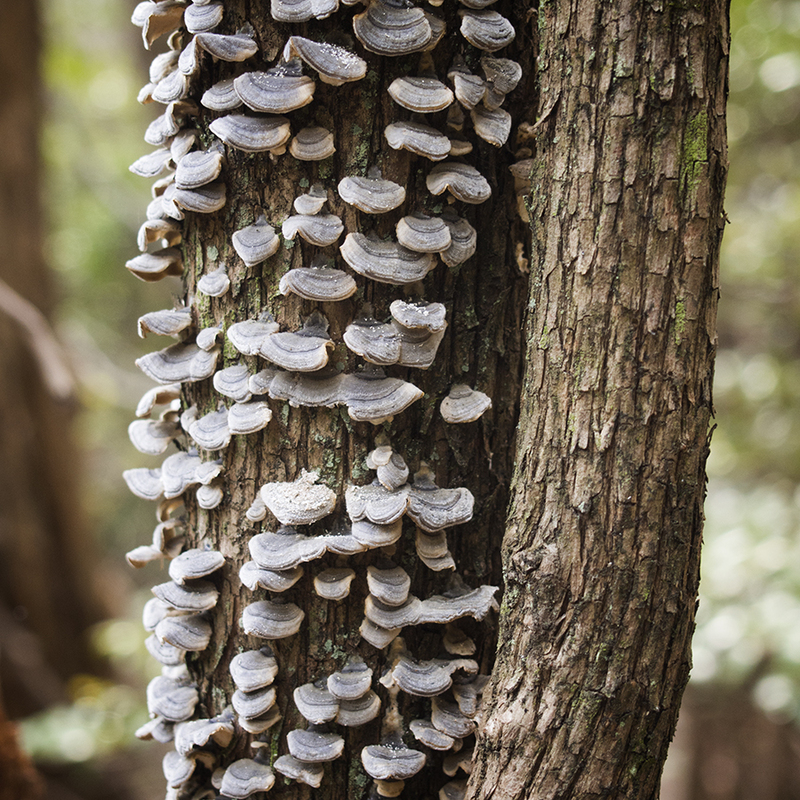 At the top of the death stairs, there was another collection of root trees, which snaked across the ground in a beautiful pattern. 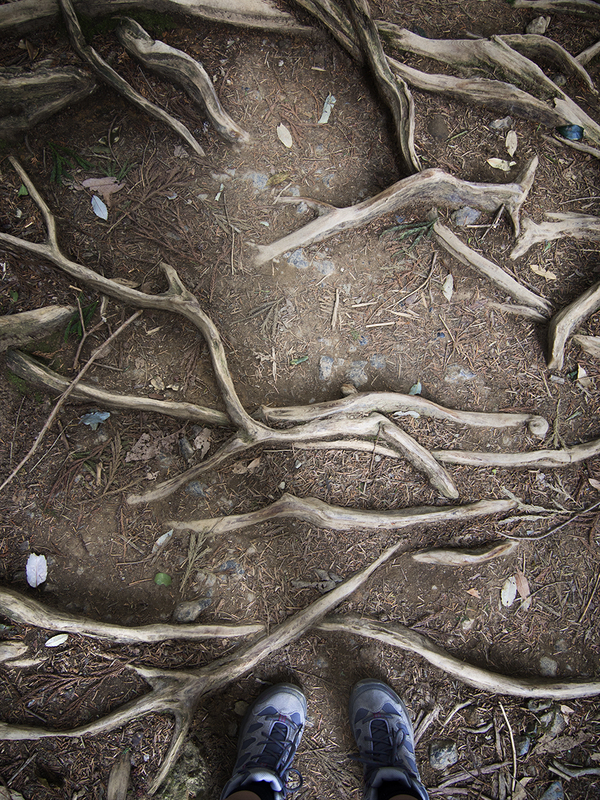 I have a thing about tree roots- I just think they’re really cool. And then, there were stairs that went down! I was so excited. 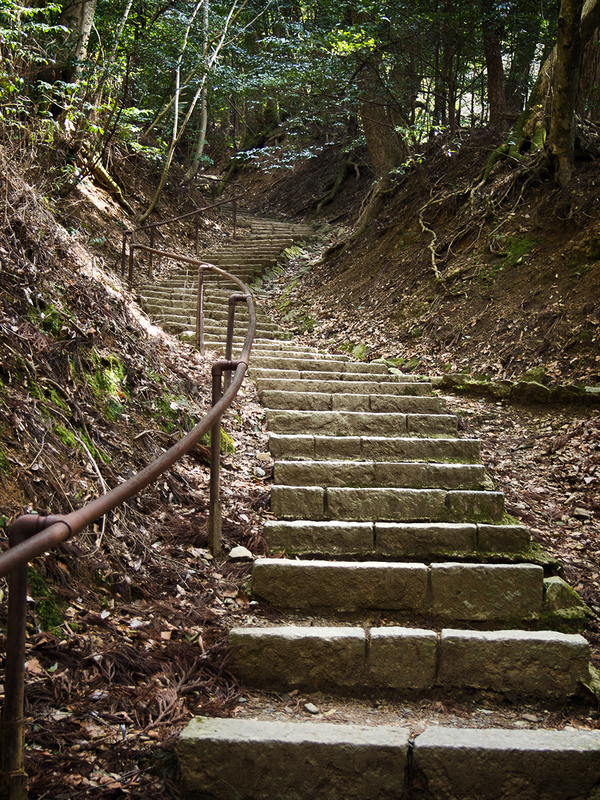 These stairs led through more forest, and eventually came out at a large temple. 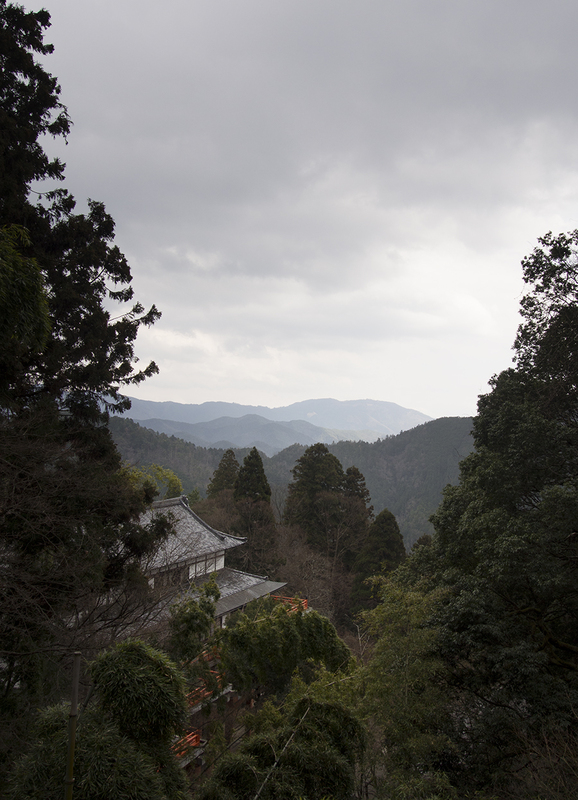 I started to rain again, but the view from the temple balcony was so beautiful, and all the mountains faded into the distance in different shades of blue. I felt so free and calm, I think hiking tends to de-clutter my brain. 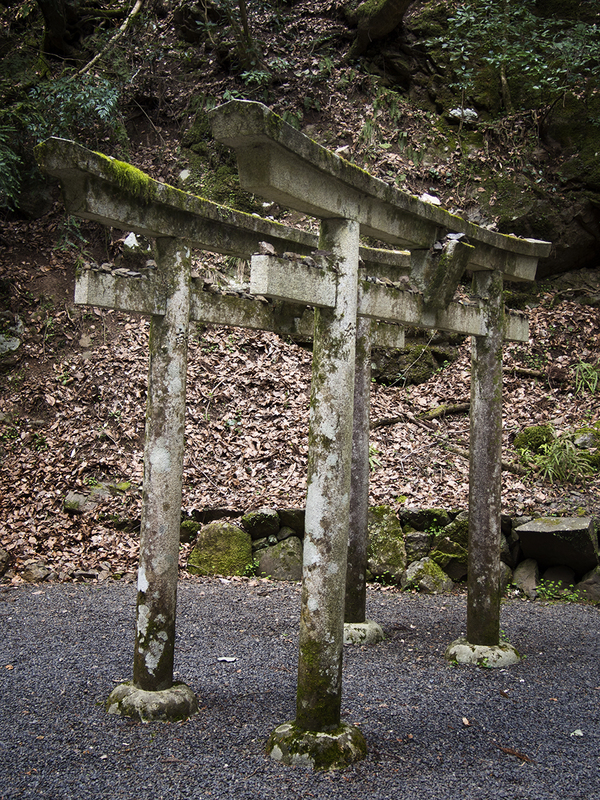 From the shrine, the path kept leading downwards, and I passed more forest and little shrines and lanterns along the way. I happily passed all the people coming up, feeling a bit smug that I had chosen to walk the course in this direction, because I ended up going down a lot more than I went up. He he, suckers. Then, I was suddenly at the bottom. I had arrived in Karuma in only an hour, which I thought was strange. I really thought I remembered reading that it would take about three hours. Maybe it does if you walk in the other direction, who knows. Anyway, I was a bit surprised and stunned, but I walked around the small town on Karuma, then headed back to the train. 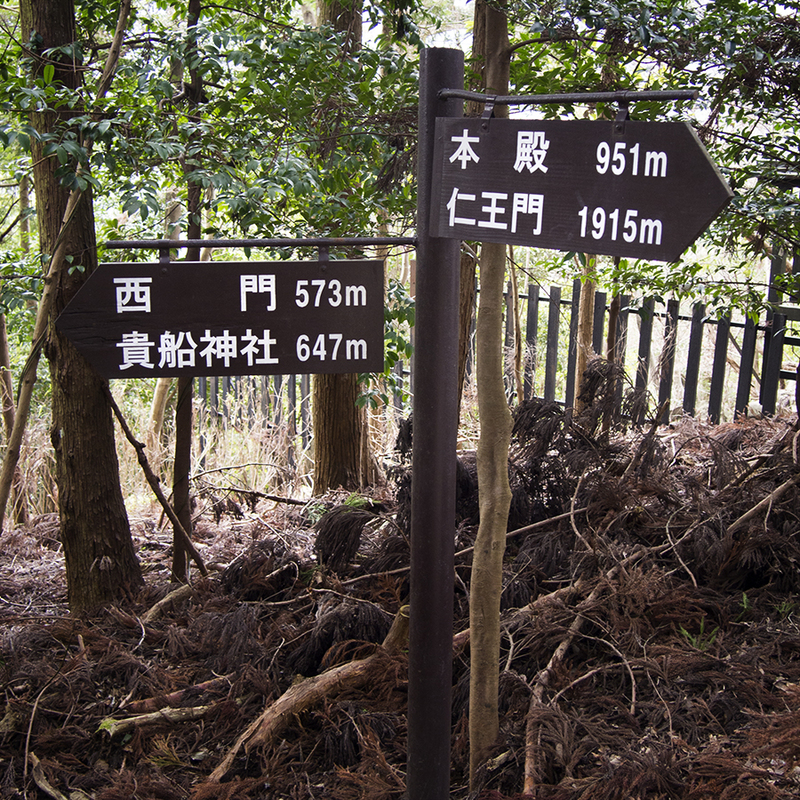 I was actually surprised how easy the hike had been, as I was expecting it to be a bit harder and longer. But I was also happy that I had completed it. The train ride home was fast, and at the station I bought a chestnut flavoured daifuku from a little stall. It was only 3:30, so I decided to catch the subway to Gion, and buy some food for dinner from the department store there. 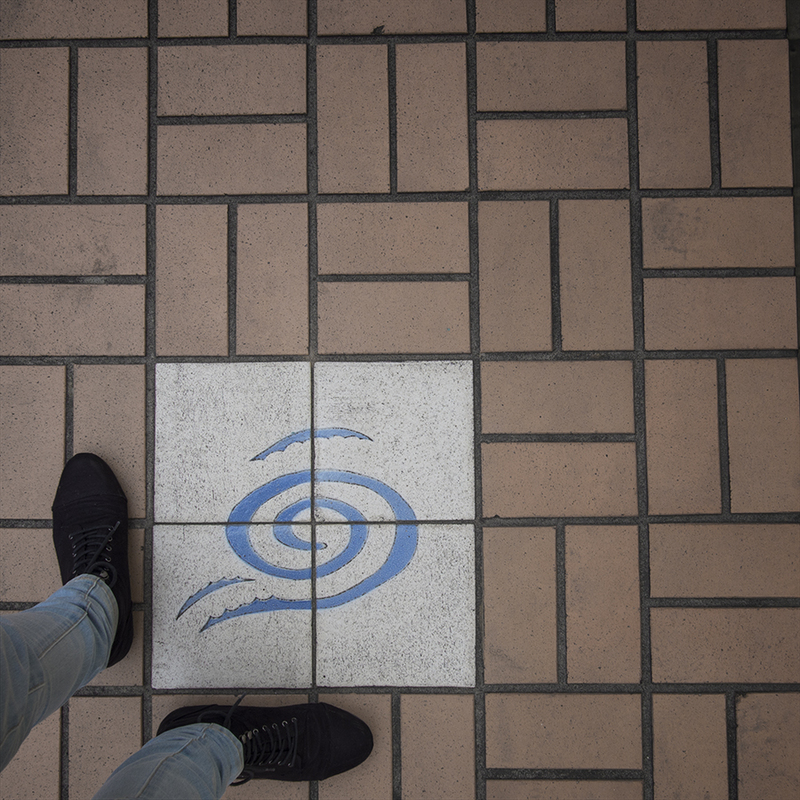 It felt strange riding the subway in Kyoto. 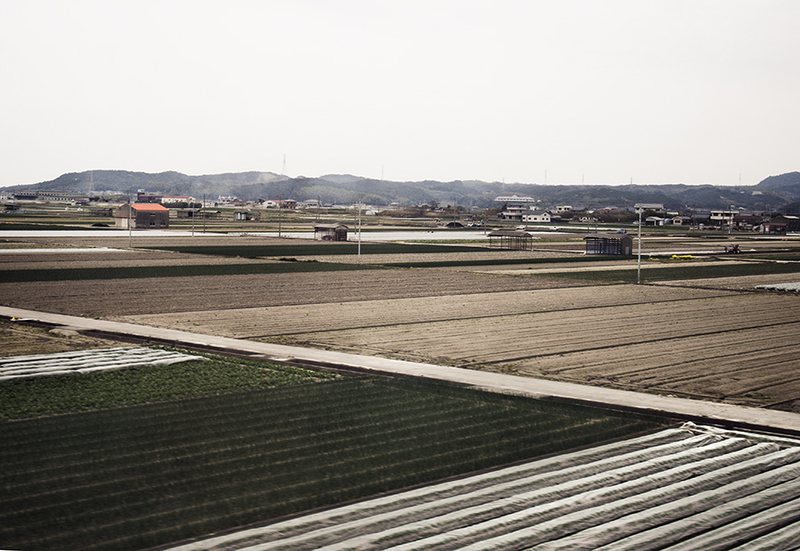 I associate trains and subways with Tokyo, so I felt kind of out of place. There was also only 4 people in the carriage, whereas in Tokyo is would be full at all times of the day. In Gion, I wondered around the basement food level of Takashimaya, then walked through Nishiki market, and all the way back to the hostel. It was freezing, and the wind was icy. My legs got really cold because I was still wearing shorts. 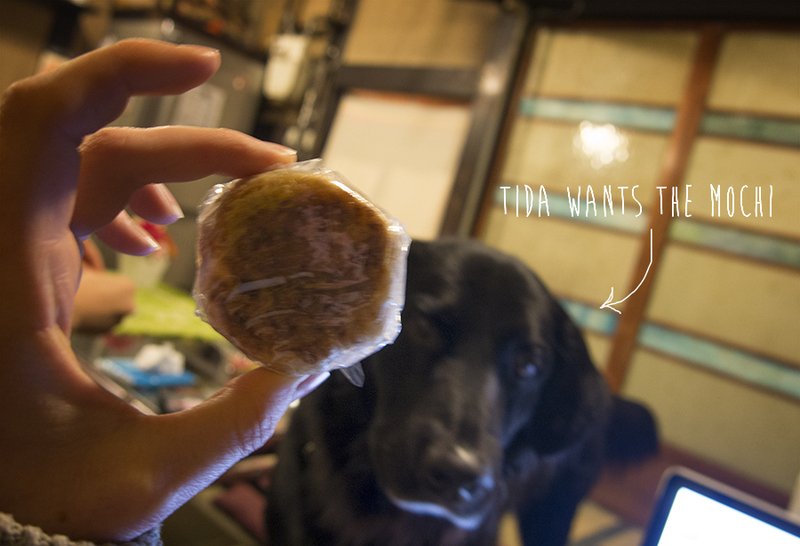 When I got back, Tida the dog greeted me, and I learned that he was about to be taken for a walk. I was invited to come, and I said yes, because they were only going to a nearby park. Tida liked eating the grass. It was freezing, so we didn’t stay out long. I warmed up in my room, and then it was time for dinner. I was so hungry, having worked up a huge appetite from hiking all day. So I went all out and made a huge tei shoku dinner. I made a donburi with brown rice, topped with some cooked spinach and mushroom from the supermarket, and an egg, which cooked in the heat of the other food. I also had a cabbage salad, some miso soup, and the collection of food that I’d bought from the department store. It was amazingly delicious, and I ate everything. I ate dinner with 2 staff members and another guest. I like how everyone just joins each other and talks. It’s really homely, and it feels like a little family. 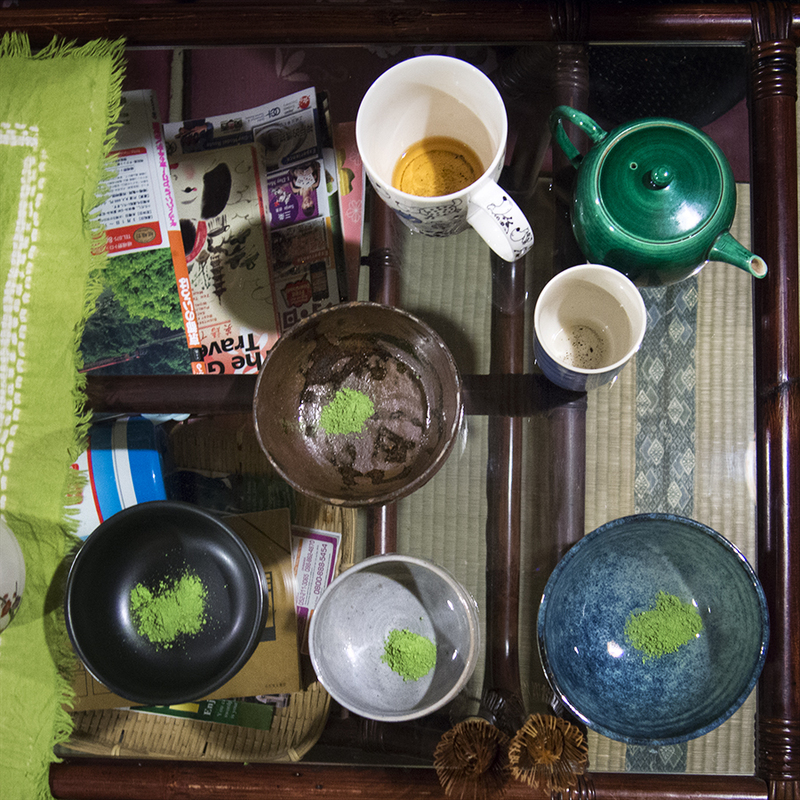 One of the girls has been learning how to do the tea ceremony, so we had a little practice one, and drank the matcha tea with daifuku ice cream and matcha Kit Kats that I’d bought. I had a go at whisking the tea, which was much harder than it sounds. I can’t believe tomorrow is my last night in Kyoto already. Time is zooming by and I’m gling to be back in Australia before I blink. 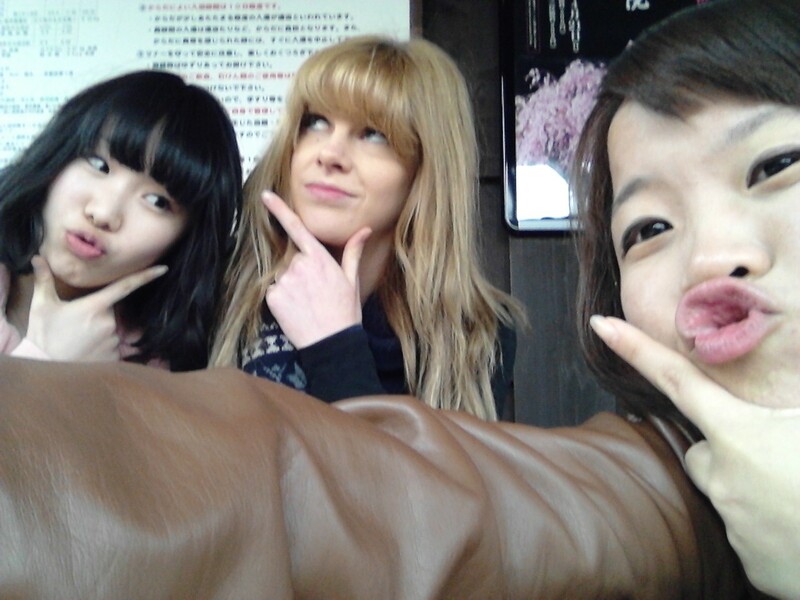 Tomorrow we are having nikujaga party at the hostel, for my last day. They have last day parties for everyone, so there’s a party almost every day! It was bike day again today. 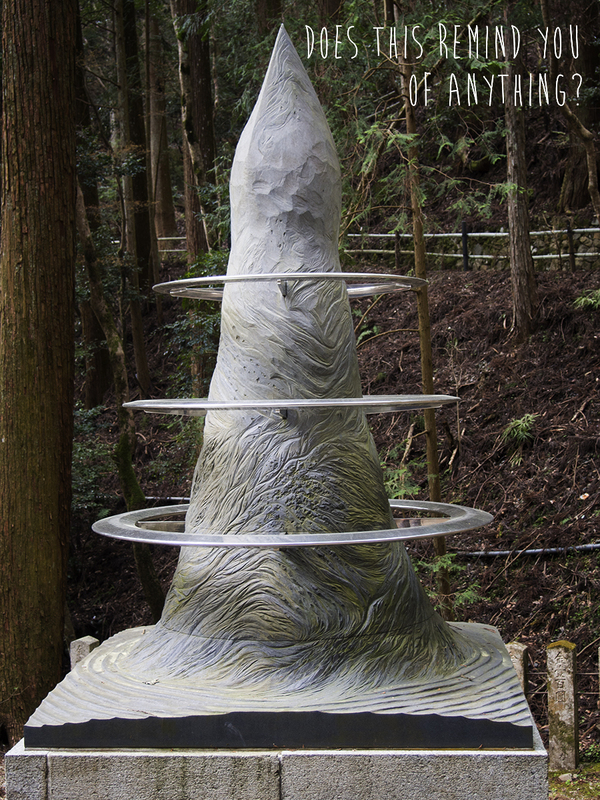 I wanted to visit Arashiyama, which is a town at the foot of the mountains in Western Kyoto. I’d been there before, many years ago, and wanted to explore it more thoroughly, and take some photos. My body wasn’t sore this morning, so I think it’s gotten used to being abused and tired out every day. I didn’t feel boneless, and my legs weren’t really sore at all. And I didn’t even go in any onset yesterday! Before I left for the day, I spent a bit of time at Mundo, doing boring things like laundry and trying to find accommodation in Shikoku (where I might visit in a few days, if things work out.) 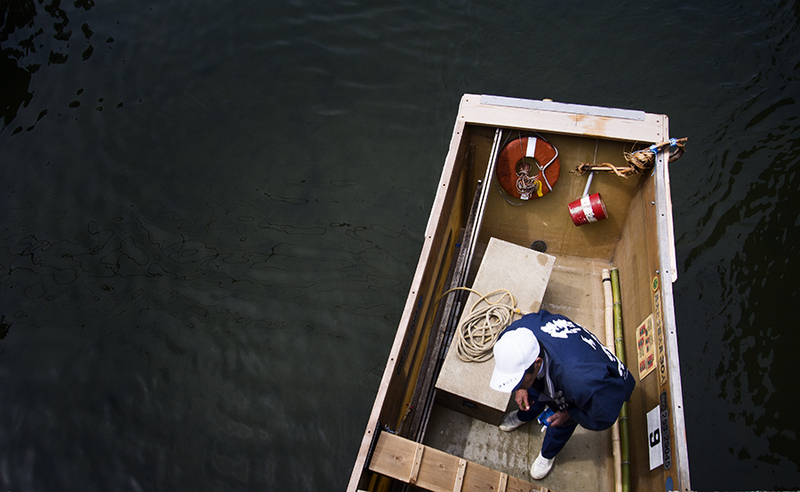 I also talked to Kazuyo, who is a new staff member, beginning today. She was really excited that I was going to Arashiyama, because she had read about an ashi no yu (foot bath) that is inside one of the train stations. I said I’d try to find it, and would take a picture if I did. 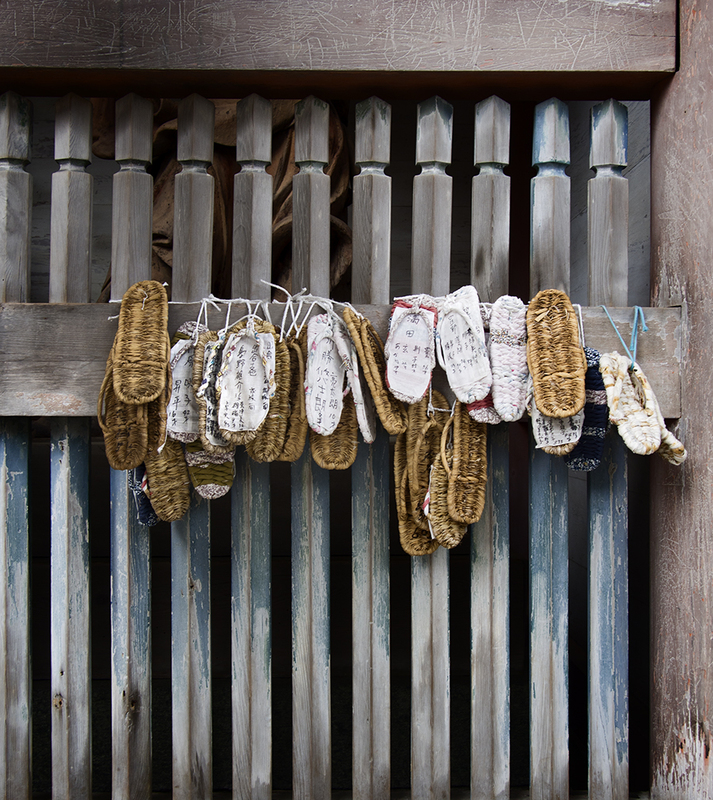 At 11, I hung out my washing to dry, then borrowed a bike to ride to Arahiyama. It looked kind of far on the map, but I was sure I could get there without too much trouble. I was also excited because I had a bike with a basket today, but that actually made it harder to steer, and I kept thinking I was going to run into things when I had to go through narrow spaces. I rode for a short while, then stopped at a supermarket to buy lunch. I had no idea how to work the bike stand, because it as different from the ones I’m used to, and I couldn’t get the bike to stand up. I must have looked like an idiot, because the supermarket security guy came over to help me, and assembled the stand in one easy, fluid motion. So I felt so stupid as I entered the store. But that wasn’t the end of my troubles. When I wanted to get back on the bike, I couldn’t work out how to make the stand go away. No amount of kicking made it budge, and I couldn’t see any levers or buttons that would release it. So I spent a while looking hopeless again, before and old man passing by stopped and helped me. 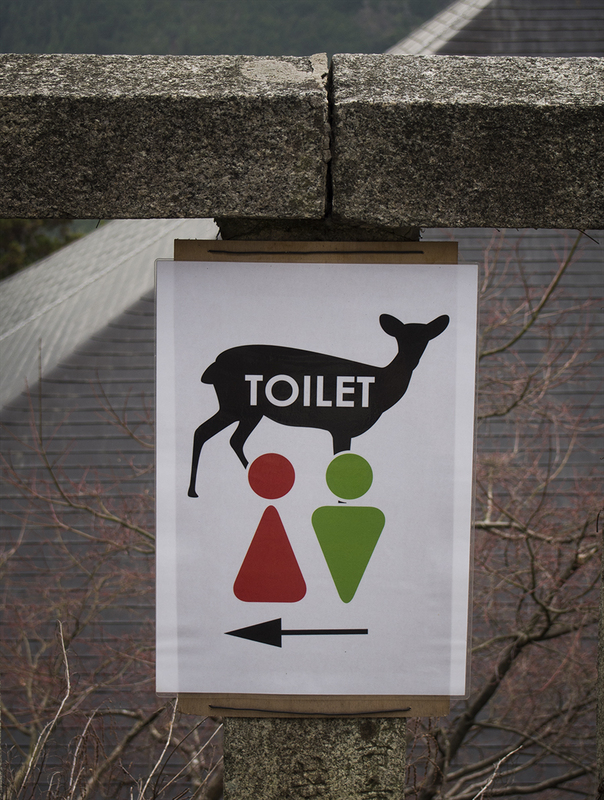 Japanese people must think that foreigners are idiots. 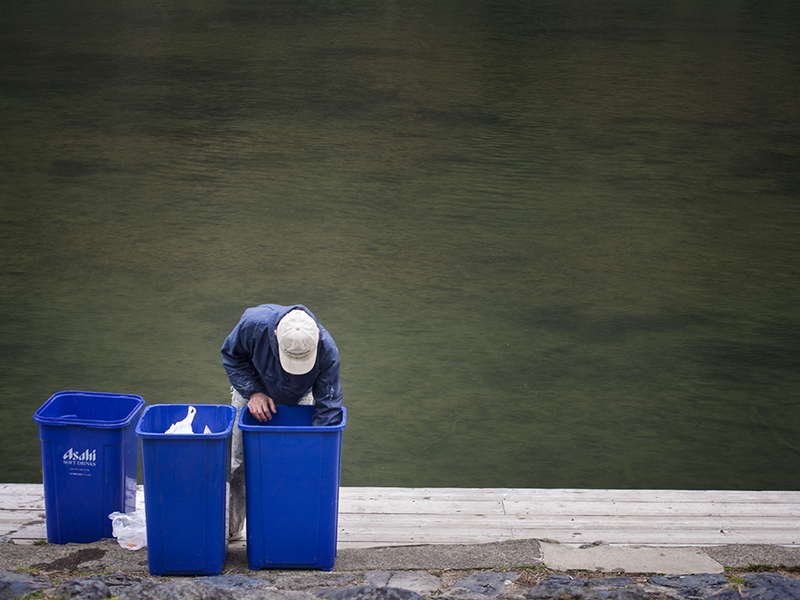 Arashiyama looked nothing like how I remembered it. I remember taking a bus to the middle of nowhere, and walking for ages through a sparsely populated town with only a service station and a few tiny noodle shops. 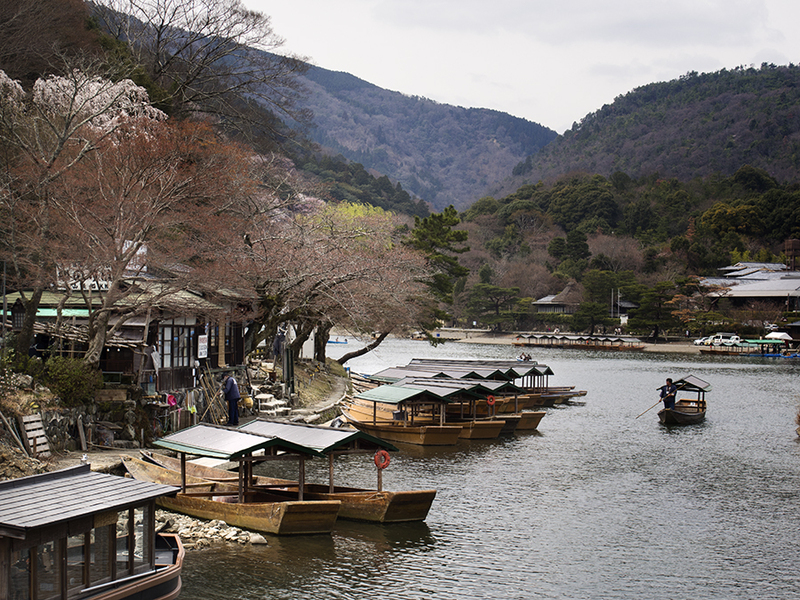 This Arashiyama was bustling with visitors, and the streets were lined with food and snack stalls, restaurants, and large souvenir shops. There is a main bridge, which is supposed to be a symbol of the town, and people were walking over it to more restaurants on the other side. It reminded me of people walking from Jolimont station to the MCG. i have no idea why. 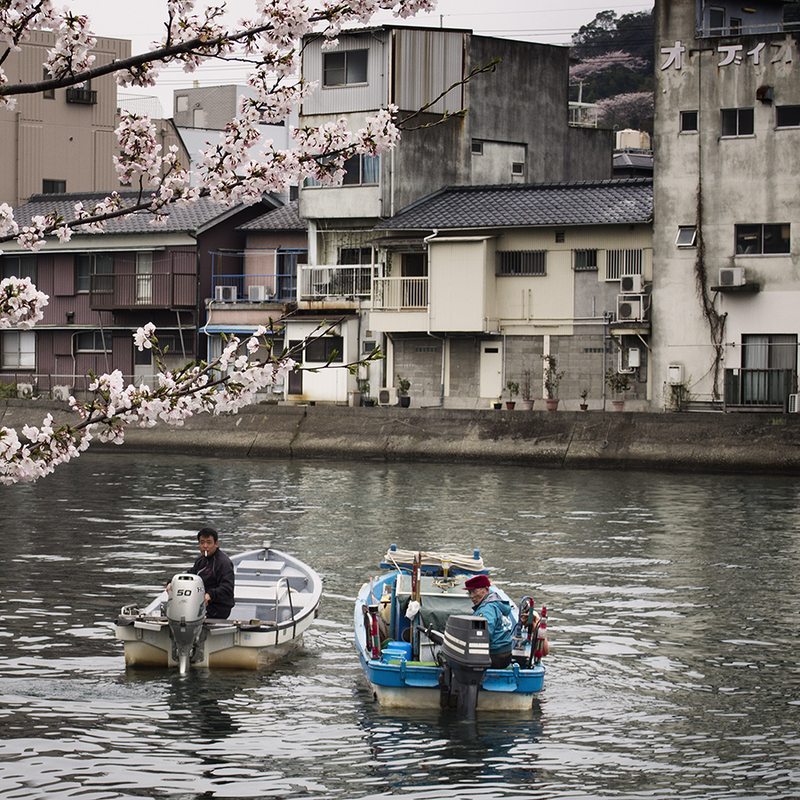 There were sakura trees along the river, and some had started to bloom. I walked across the bridge and explored a few shops, many of which sold green tea products and ice cream. I ate my lunch on the river bank, in a ‘park’ that was really just gravel on the edge of the river. But there was little benches so it was all good. I had the same salad as yesterday, which I am going to miss, and a new kind of onigiri that I’d picked up from Lawson. 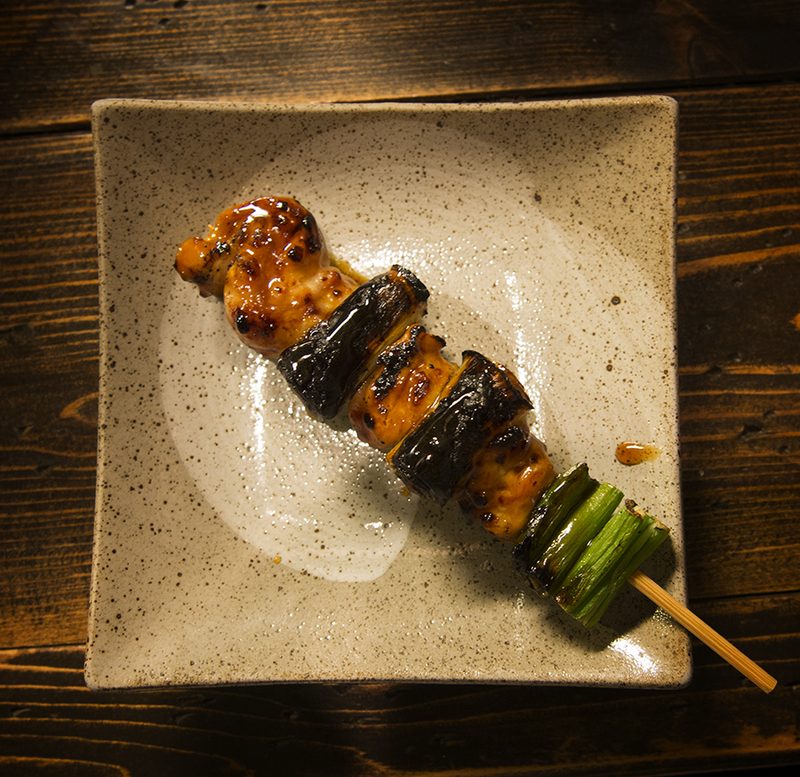 It was called ‘tsukune,’ so I was interested to try it (for those with a sharp memory, tsukune is the balls of minced chicken on a stick that you get from yakitori shops.) It did have a ball of chicken in it, as well as some kind of sweet orange sauce. It was interesting, to say the least. I’m pretty sure it’s not a new favourite, however. 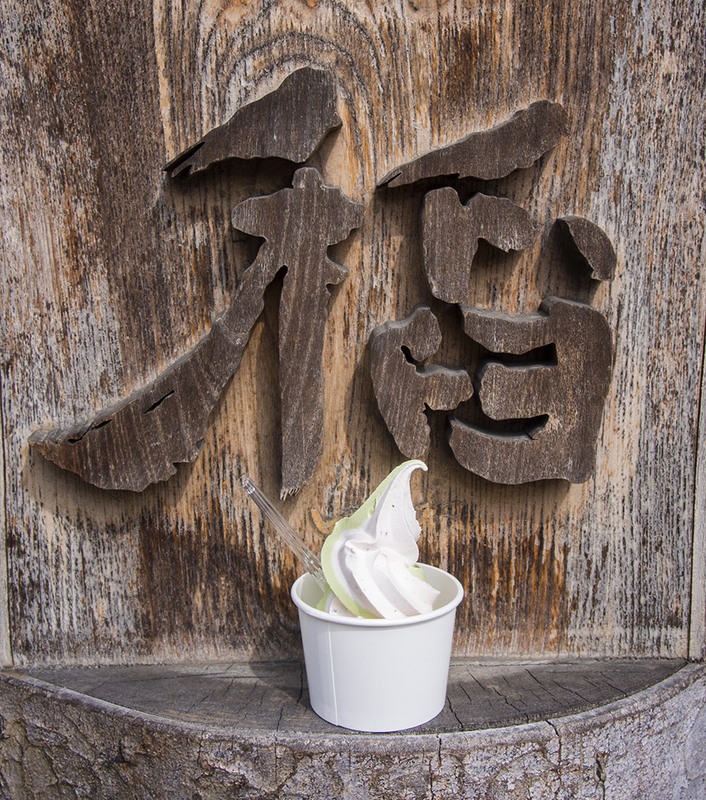 Then I had a sakura and matcha mix soft cream, because there were ice cream stalls everywhere and I really can’t resist. 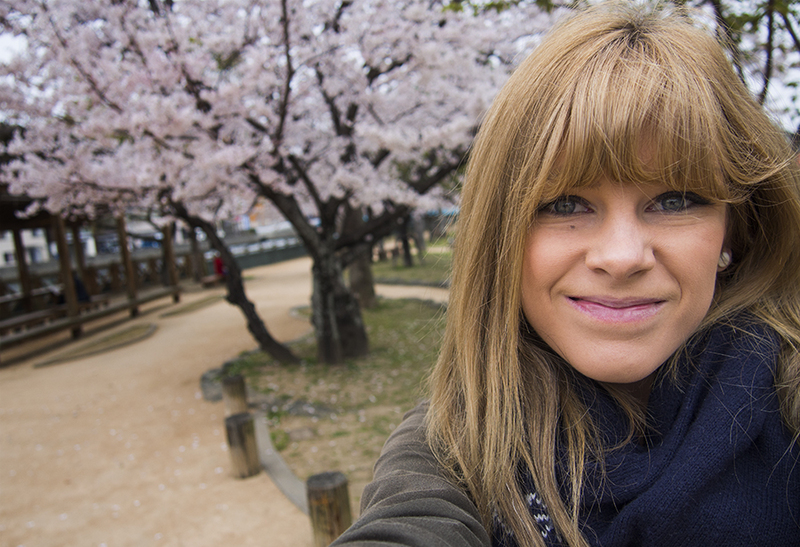 The sakura was different to the one I had in Kiyomizu. It had little pieces of the actual plant in it, and was a much paler pink colour. I don’t know which I prefer, they were both delicious. 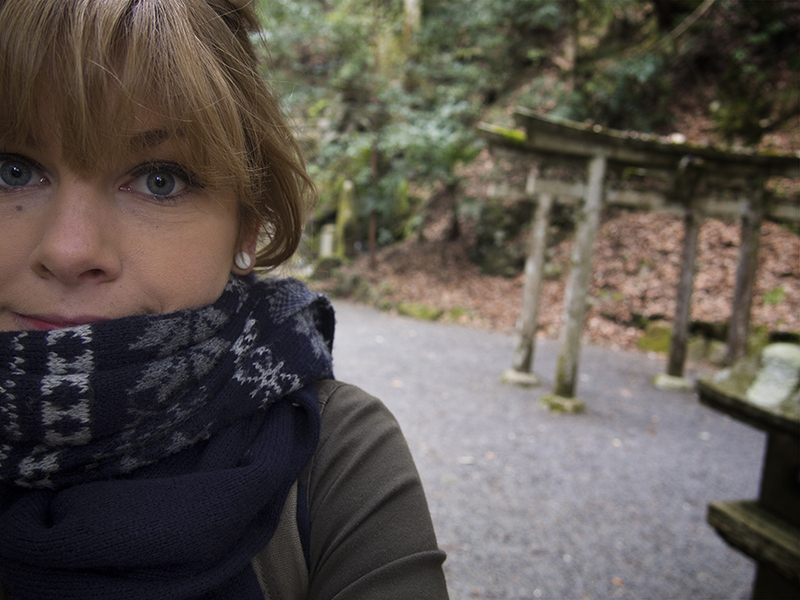 Eating ice cream made me cold, so I piled on the layers and walked to the famous Bamboo Forest, which was much closer to the town than I remembered. It was also much less spectacular than I remembered. 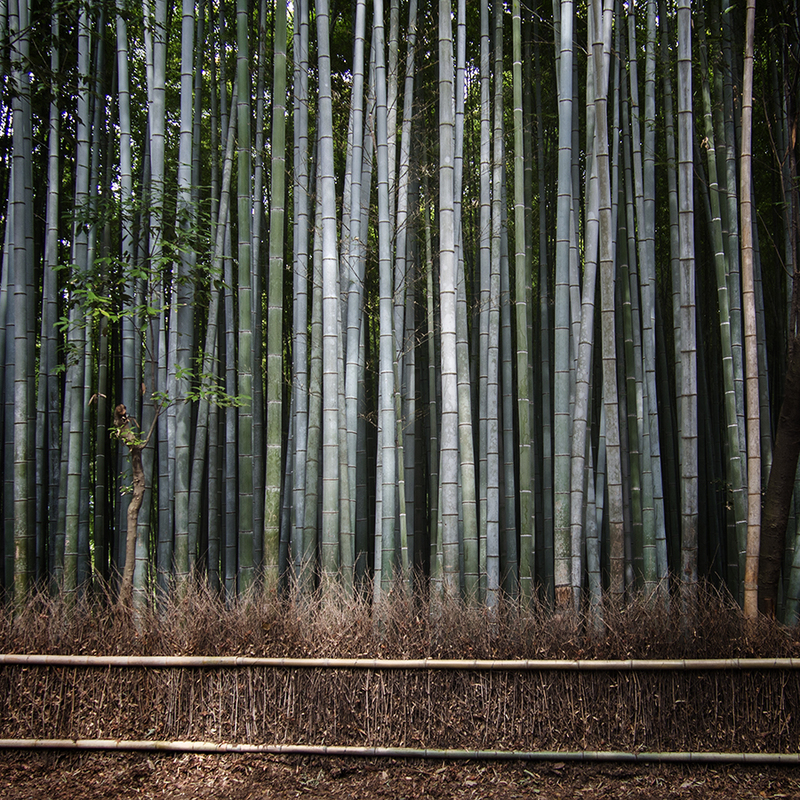 The ‘forest’ is contained within tall grass fences, and the bamboo is so tall and dense. It is very pretty, but the hundreds of tourists kind of ruined my memory of it. I remember being there with my mum, years ago, and walking along seeing only a few other people. 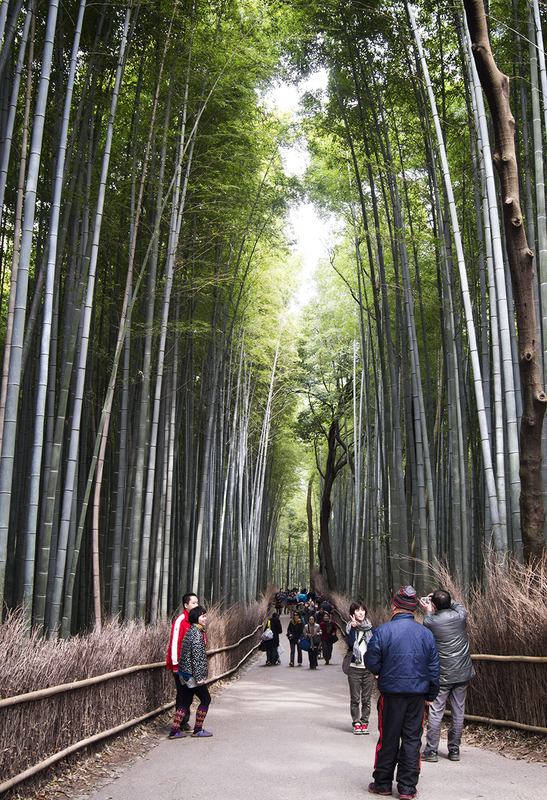 I also remember it being a really long walk through the bamboo, but it was only about 200 meters. I think my brain has glorified a lot of memories of Japan, because the places that I revisit aren’t living up to my mental images. The whole town of Arashiyama is completely different to how I remember it, and Kiyomizu and Fushimi Inari Taisha were both also far removed. I don’t know if this is because they have become more commercialised, or because my memoirs are false. 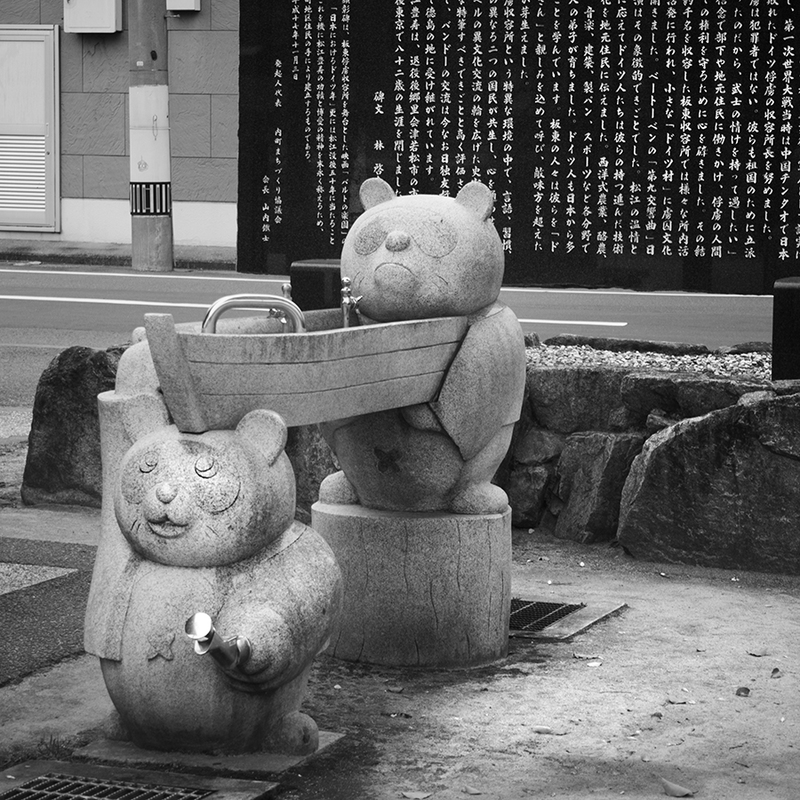 Anyway, at the end of the bamboo forest, I wasn’t really sure where to go, so I walked through a park where a boy and his dad were playing baseball, and other little kids were running around with their friends. The park was on a slope, and I walked to the top of the slope to a ‘lookout point.’ I didn’t expect much, but the park was actually on the edge of a cliff, that cut deep down into a valley. The aqua coloured river snaked through the valley, and little boats were floating along the gentle rapids. The water was so clear that even from the hight, I could see the riverbed beneath. 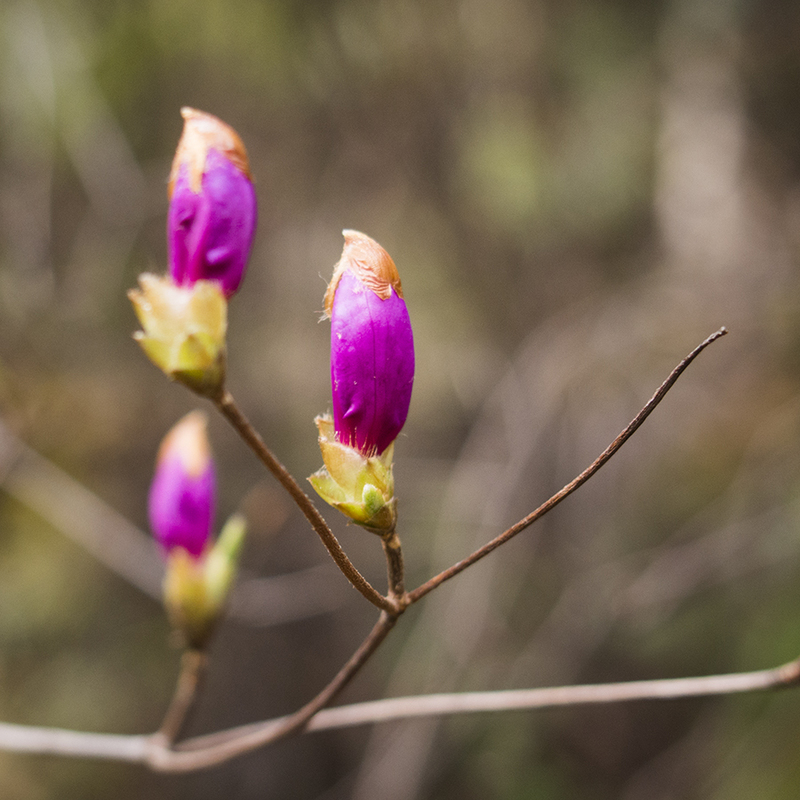 The mountain was dotted with patched of pink and white, where cherry blossoms and plum blossoms were preparing to bloom. 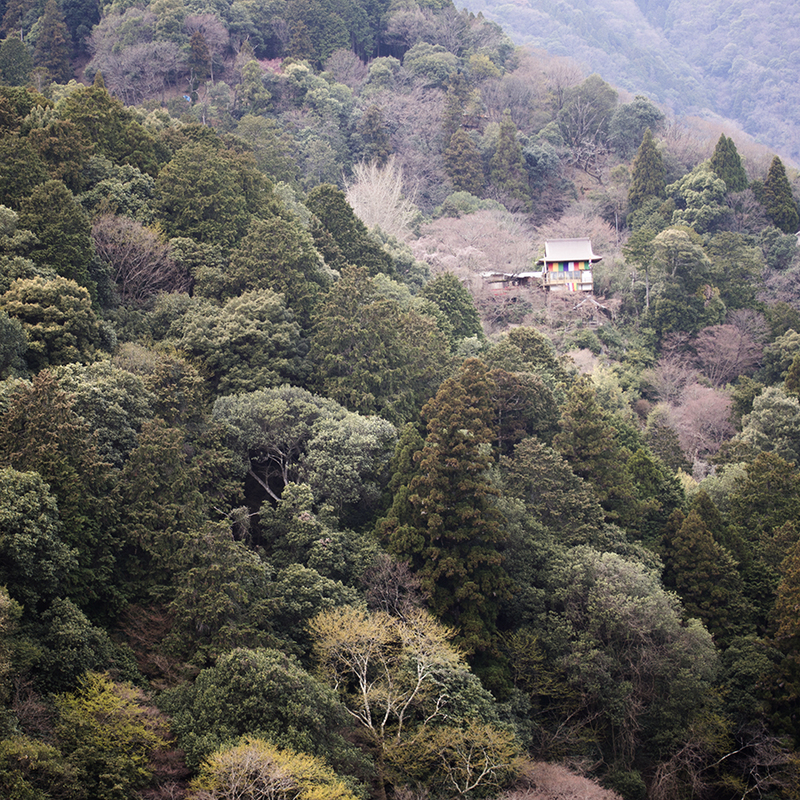 A shrine perched precariously on the side of the cliff, covered with Himalayan prayer flags. For a long time I just looked out at the view in awe, and watched one of the boats do donuts in the water. Then I headed right, to see what other visual gems were hidden up the back of the park. There were spots to see the river from different angles, and a few picnic places. Then I got to a sign that said (in Japanese) ‘the park only goes to here.’ Beyond the sign, a train covered in leaves led off into a forest. I had no idea where it went, and there were no handy signs to tell me, so I decided to have a quick look. The path wasn’t paved, and was uneven and covered in rocks and dead autumn foliage. I could see down to the river from some points, but other than that, I couldn’t see more than 10 meters ahead of me. The slope slowly went up, and I got further and further away from the park. I still had no idea where I was going, or how long it would take to get to wherever that somewhere was. But curiosity led me on, and before I knew it Id been hiking for about 20 minutes. In heals. 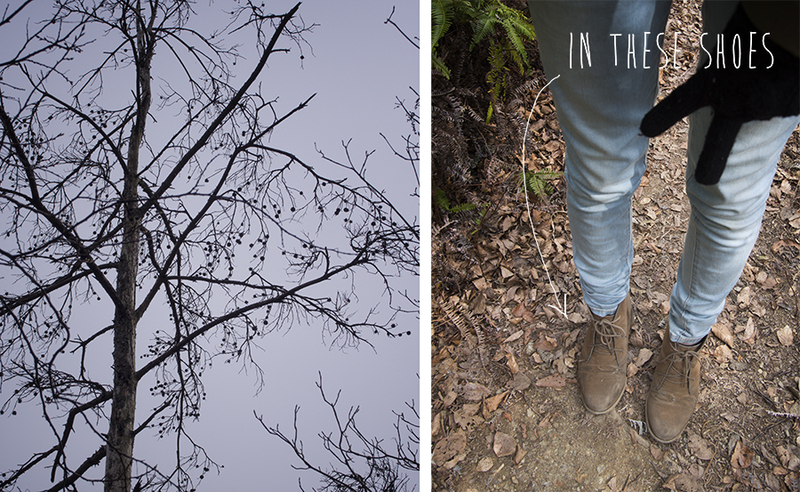 I’d become one of those people who hike in boots that are made for fashion. 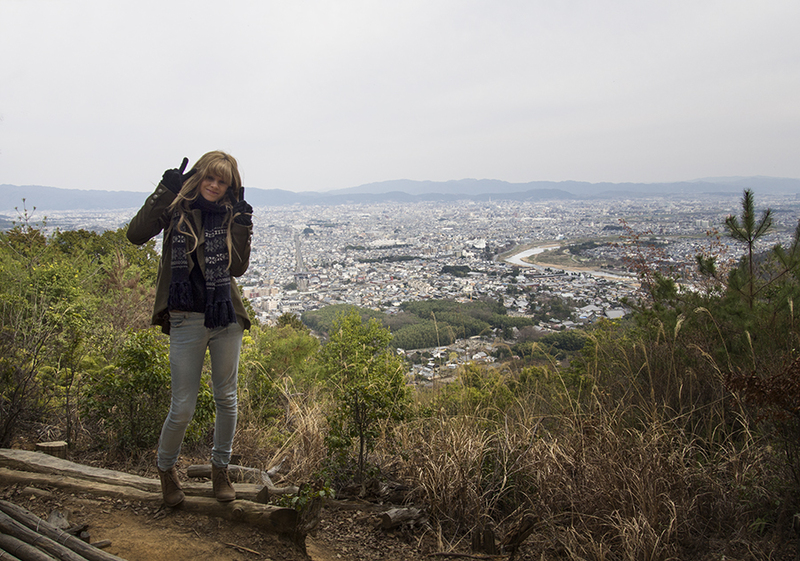 I never understood how Japanese ladies could climb up mountains wearing ankle boots, or den glittery flats with bows, but I’d become one of those people. Oh, the shame. Wow. Just wow. I think I actually said ‘wow’ out loud. The pictures don’t do it justice, but this view was incredible, and I could see out across the whole of Arashiyama, as well as some other parts of Kyoto. It was so clear, so I could see really far into the distance. I stood there admiring the view for ages, and then became a 14-year-old girl and took self portraits with the view- peace sign and all. Funny how amazing sights make my mental age and maturity evaporate completely. Feeling like my curiosity had paid off, I hiked back down the mountain and eventually ended up back at the park, just like I’d hoped. The descent was so much steeper than the ascent, so I was glad I’d walked clockwise instead of the other way around. It was already 5, so I decided to head back to Mundo. My bike was still where I left it, and someone had put the bike stand on properly, so obviously it had fallen over at some point during the day. I bought a few souvenirs for two of the staff at Mundo, to thank them for looking after me, and then I cycled back towards the hostel. 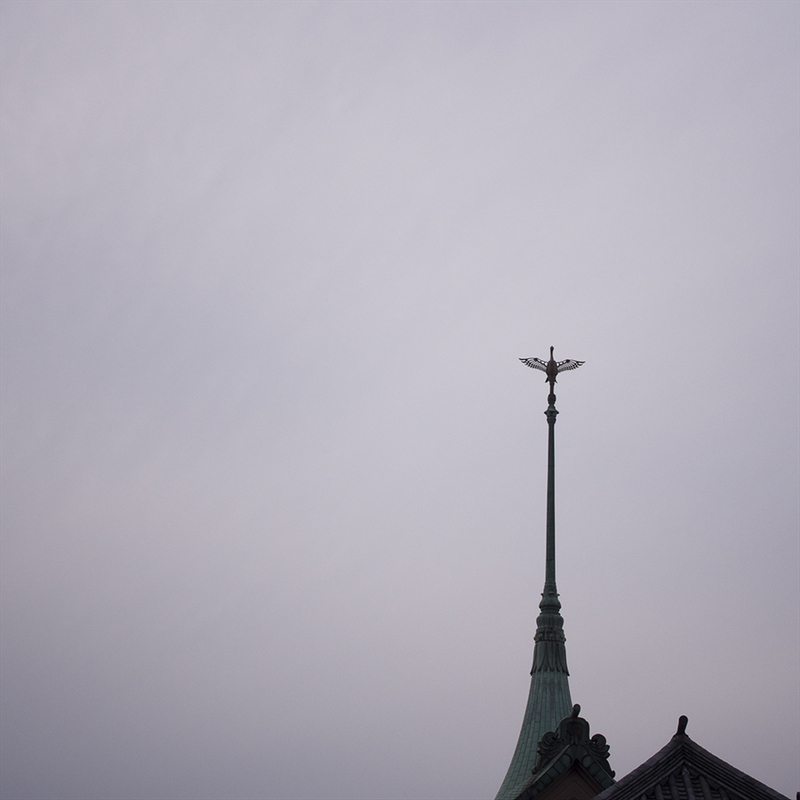 I had a better idea of where I was, and it didn’t take that long to get back to central Kyoto, but when I was close to Nijo Station, I took a wrong turn and went south instead of north, and ended up in the opposite side of the city to where I needed to be. But I knew where I was, so it was ok. I ended up adding an extra loop to the return trip. I stopped at a few Lawson 100 stores to try and find the matcha pudding I’d eaten last night, because I’d offered to buy it for a few people who were interested to try it. I had to go to three different stores to find it, and when I did, they only had 2 left. I got home around 6:30, and the house smelled amazing, because dinner was cooking. 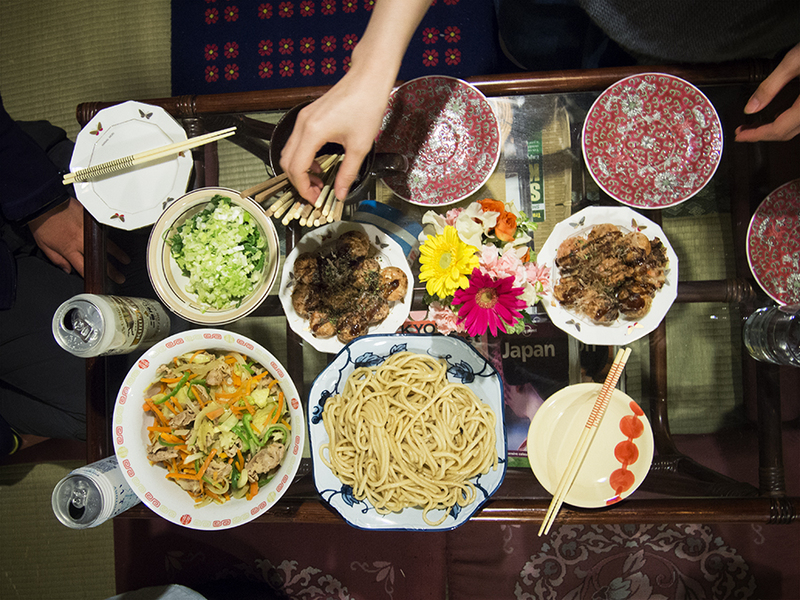 For my last night, we were having a nikujaga party. 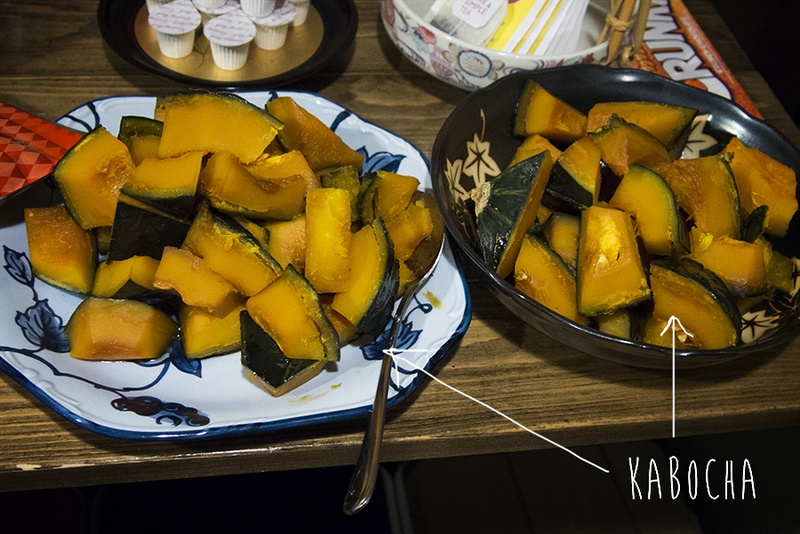 Midori and Kazuyo had been busy preparing kabocha and the nikujaga stew, using special potatoes from Okinawa. There were 10 of us at dinner, including 2 Italian girls, a French couple, Midori and Kazuyo, TIda the dog, and Kumiko-san (who kind of adopted the role of my mother at Mundo. At 7, we all sat down together to eat. 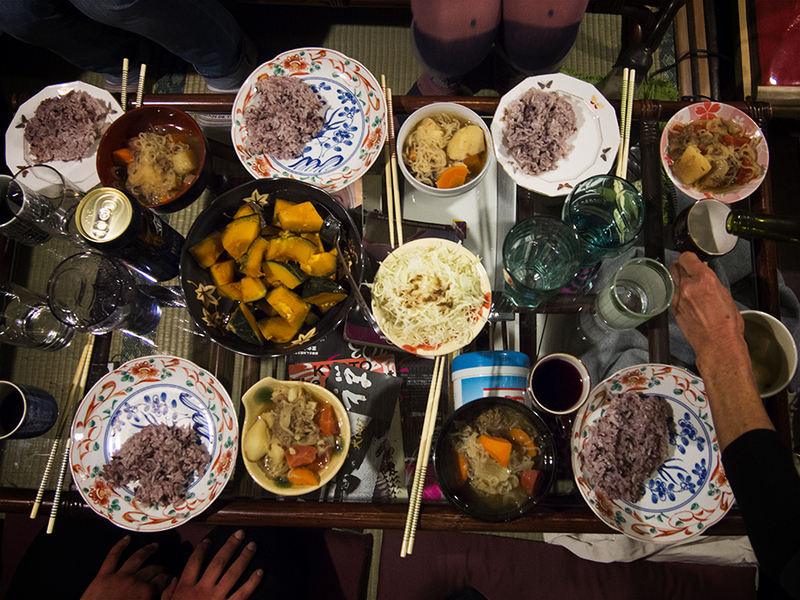 We had special sekkihan rice, which is purple and is cooked with azuki beans, as well as miso soup with tofu and mushrooms, the simmered kabocha, cabbage salad, and the nikujaga. For those who don’t know, nikujaga is a very homely dish, and it’s basically a stew containing thinly cut beef, carrots, potatoes, and noodles. The food was incredible, and we had it with plenty of wine (Midori loves wine, and beer, and most alcohols.) I was really full after the first bowl of nikujaga, but I had 3 more bowl afterwards because it was so good. We stayed up late talking and eating snacks, and I felt sad that it was my last night. 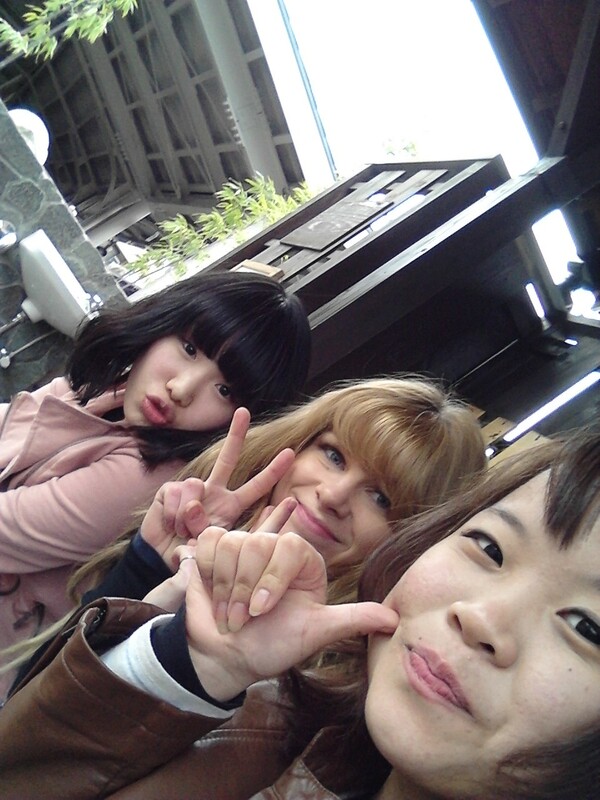 I think I become attached to people really quickly in Japan. I felt like I was leaving another family. Mundo isn’t like normal hostels, where you fear everyone. Here, everyone is family. 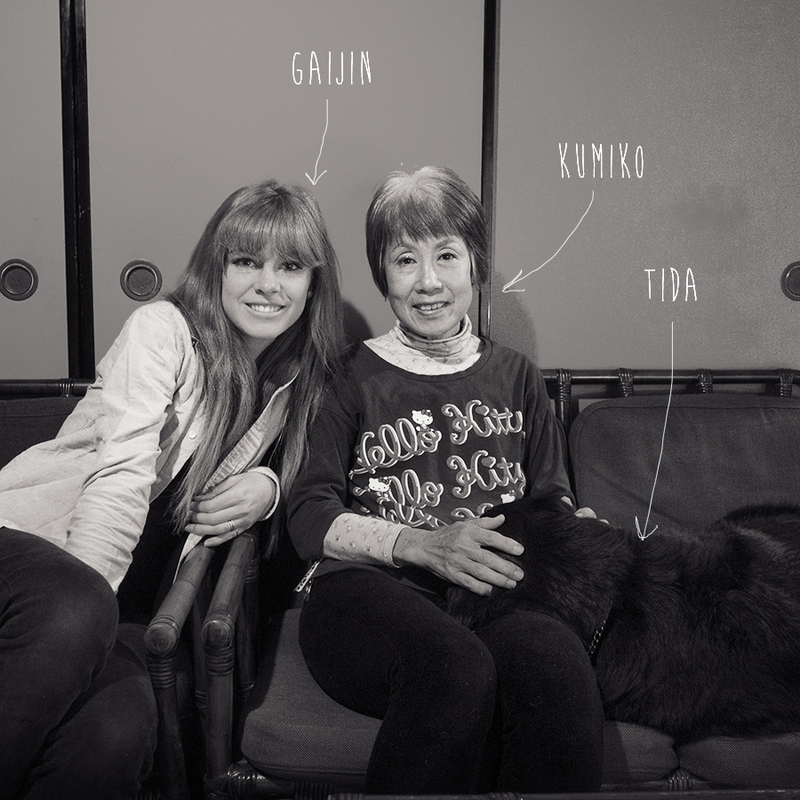 The staff and the people staying there change every day, but it still feels familiar and safe and warm. I just really like the feeling of homeliness. I don’t even mind being able to hear everyone moving around anymore. Before you start reading this post, please click this link and have the YouTube video playing in the background. You don’t need to watch it, you just need the sound effect. Ok, so I’m a 90’s kid and and unashamed of the fact that I still think Pokemon is cool. Nerd at heart. After tiring out my body by walking for 9 hours yesterday, I thought that renting a bike would be a good idea today. The hostel I am staying at has a rainbow collection of bikes, and rents them out for 500 yen a day. 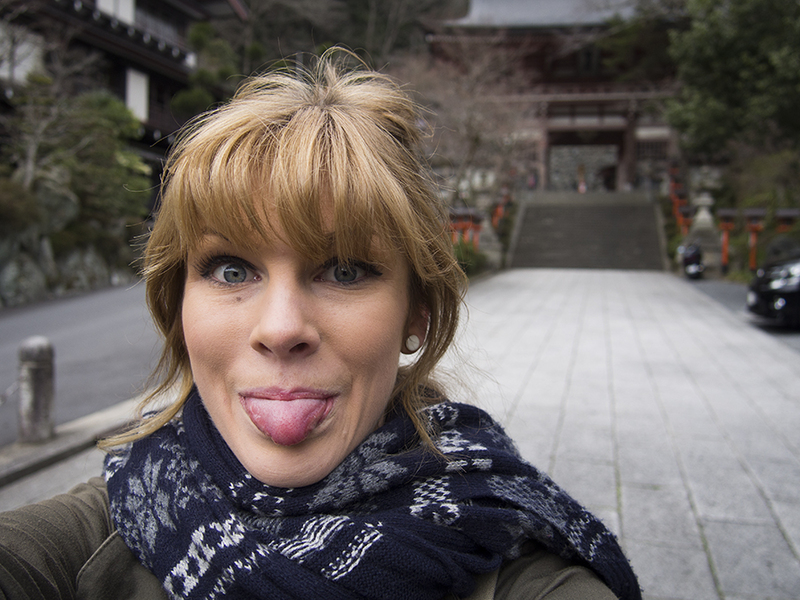 So in the morning I set out on two wheels instead of two feet, ready to explore some more of Kyoto. I couldn’t help but sing the Pokemon bike theme tune whilst I rode along. It was seriously the most perfect tune to have looping in my head. I had that same feeling as when you first acquire a bike in the gameboy game- everything is so much faster and walking seems like a stupid idea. Ok, I’ll try to stop referencing now. Sorry. You can turn off the YouTube music too, if you do so desire. It’ll be stuck in your head for the rest of the day anyway. I felt so free and speedy on the bike, and it hardly took any time to get to the parts of Kyoto that (on previous days) took me an hour to reach on foot. I was so surprised, and a little delighted. I suppose Kyoto is made for bikes. It is totally flat, and everything is laid out in a grid, so cycling is the best way to get around for free. There are bikes everywhere, and nobody wears a helmet, so they always look attractive when they ride along, instead of dorky. And nobody wears lycra, thank god. However, being on wheels does make you realise how slow pedestrians are, and I had to do a lot of tactical dodging and weaving to avoid them. You also have to be really good at riding VERY SLOWLY when you are stuck behind a bench of old people and want to avoid hitting them. Then you kind of have to wobble along at snail pace before there is an opening for you to speed up and ride like a normal person. I rode almost all the way to Kyoto station, then headed East towards Kiyomizu-dera, which is a famous temple and a popular tourist spot. I’d been here before, and really enjoyed it, and I;m not sure why I wanted to return, I just felt drawn to visit the place again. I rode up a huge hill to get there, and then came to an intersection that was so busy with people-traffic that there were little guys in uniform directing everyone around with flashing LED sticks. Of course, stupid Steph had forgotten that it was Sunday, and a billion tourists (both Japanese and foreigners) would be out and about. 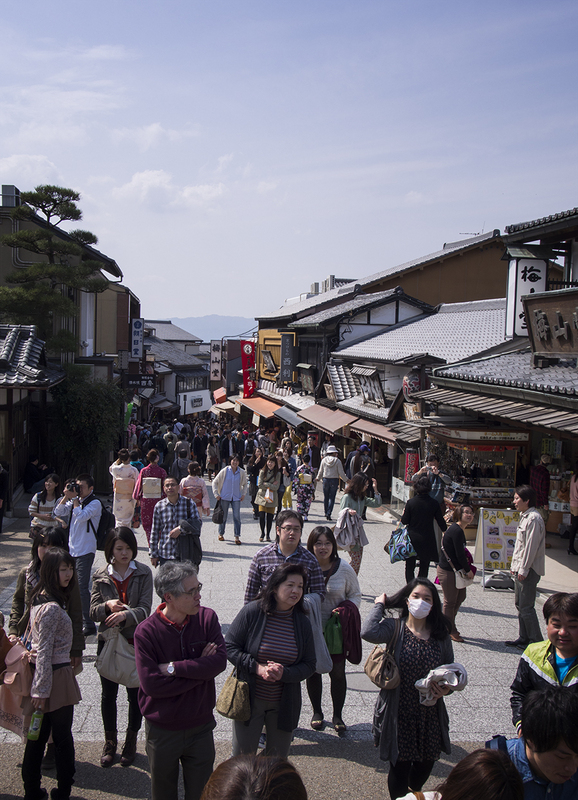 There are two shop-lined streets that lead up to Kiyomizu-dera, which I wanted to explore. But they were packed with people, so I had to ditch my bike if I wanted to be able to see anything. Luckily there was a bike parking spot, which I assumed was free. That was the one downside of a bike, you have to find somewhere to leave it, and then you have to return to it later. 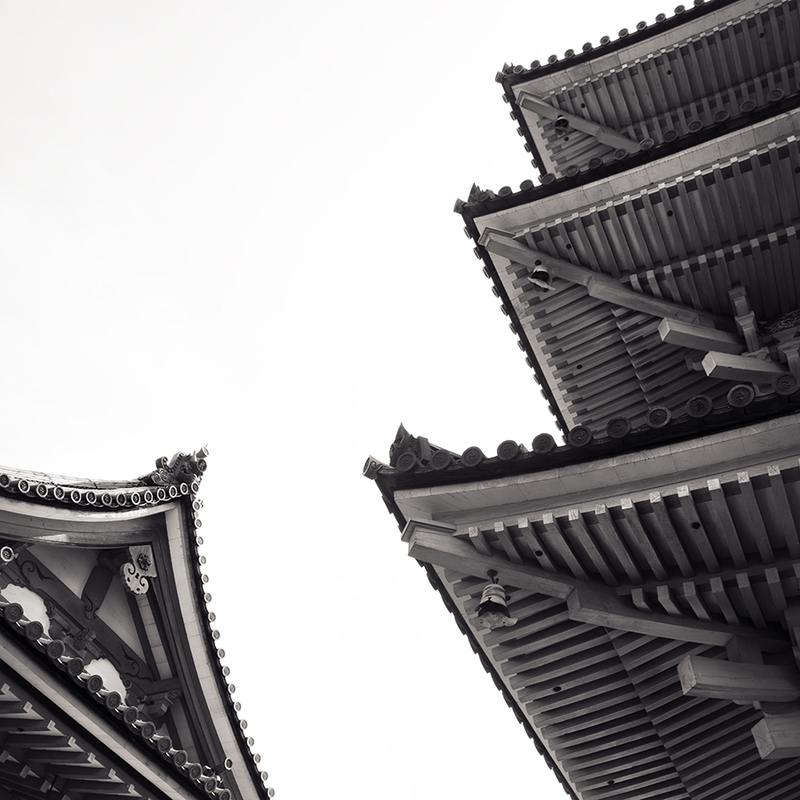 I walked up towards the temple grounds, eyeing off the stores that sold daifuku or soft cream, and occasionally turning around to look down on the hill I had climbed. When I reached the top, I realised I had walked up a side street instead of the main street, which explained why there seemed to be less shops than I remembered. 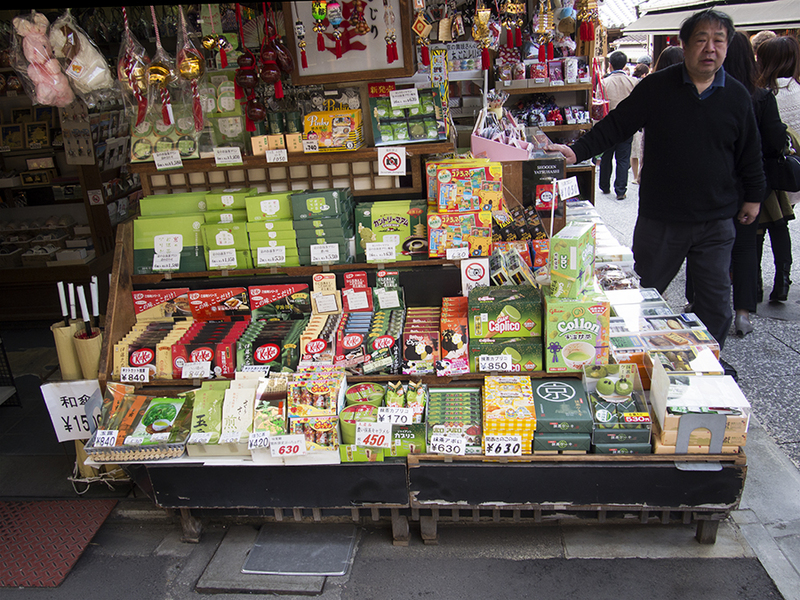 So then I walked up and down the other side, which sold everything from green tea to fans to Kyoto style sweets. 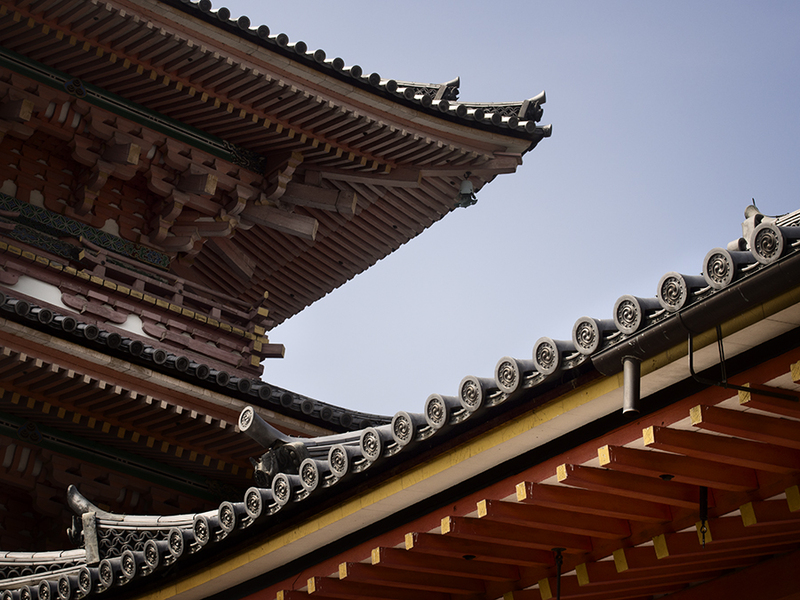 I walked up to Kiyomizu-dera, and looked around the parts that were free, but I didn’t really want to pay the admission fee and go inside, because about 1000 people were doing that and I knew I wouldn’t be able to see anything. 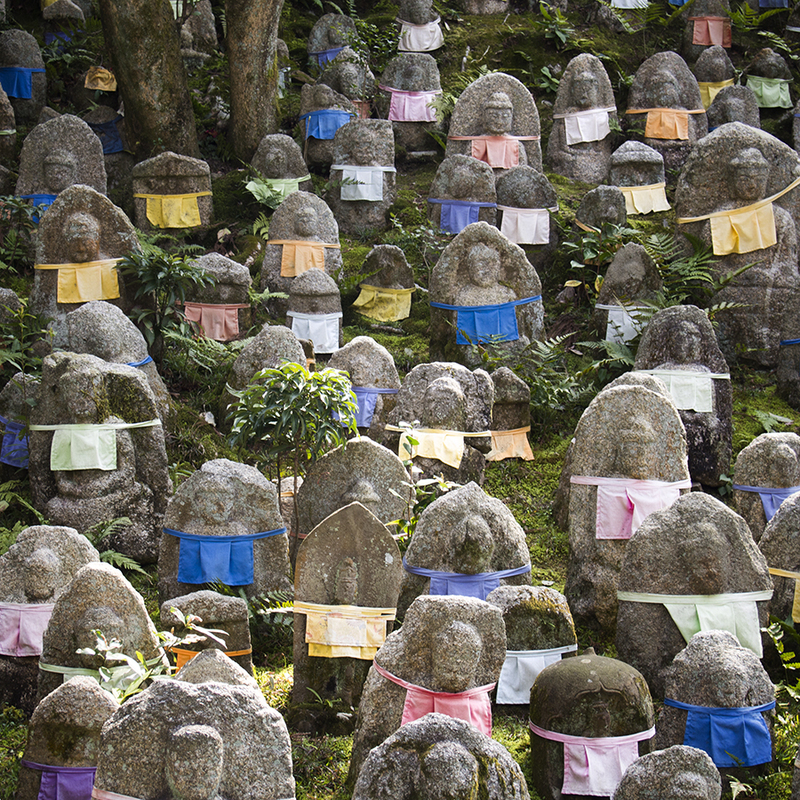 So I walked around the back of the temple and found a huge population of jizo, all wearing pastel coloured bibs. 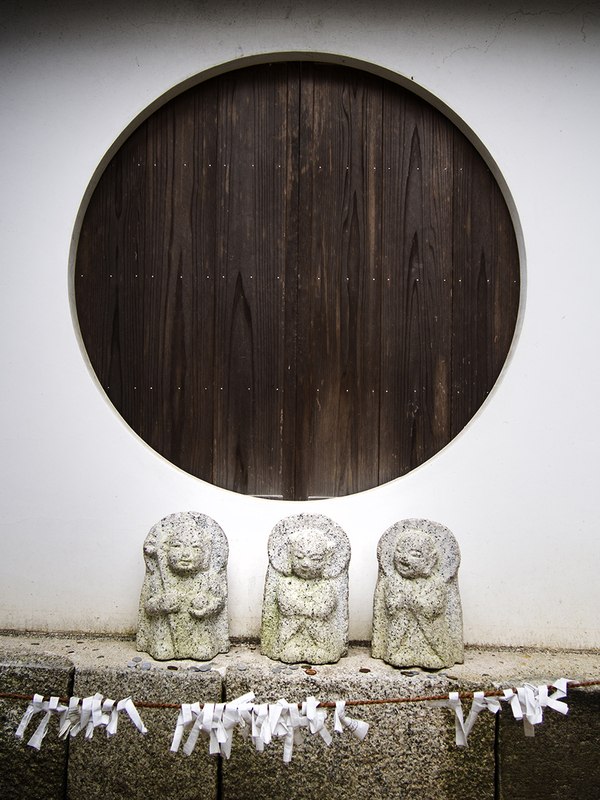 Jizo are little statues that commemorate the souls of children that have passed away, and they are a common sight in Japan. They usually wear red hats and/or bibs, and often have little toys or offerings at their feet. 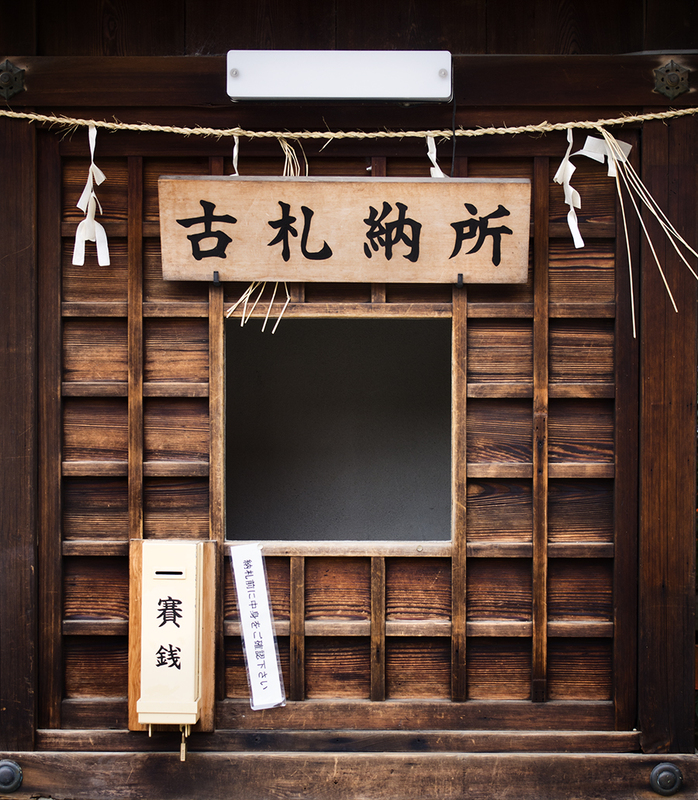 I passed back to the front of the temple, where flocks of school girls where talking pictures of each other, and kimono-clad girls were doing the same. 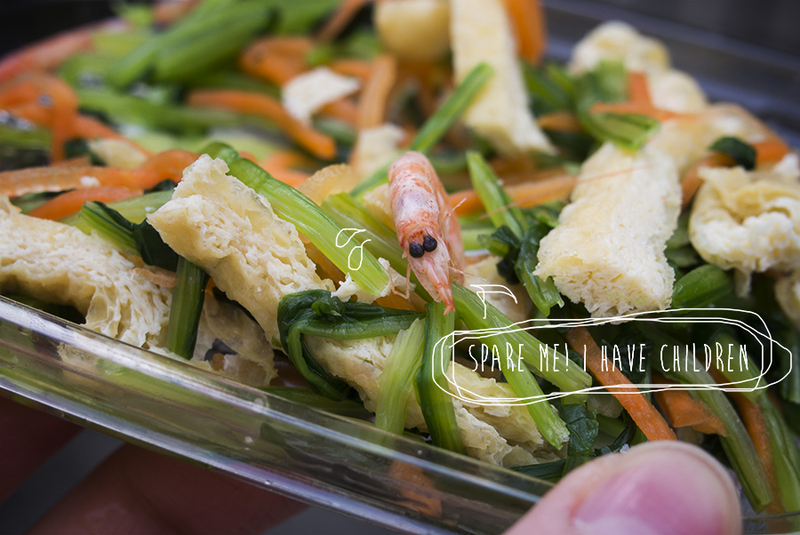 I thought I should probably have lunch, so I sat down near a fountain and ate a salad (the same one I’ve had every day because it’s that good), and this little vegetable and tofu dish that had tiny baby prawns in it. I felt a bit mean eating their faces, but they were so tasty so it was worth it. 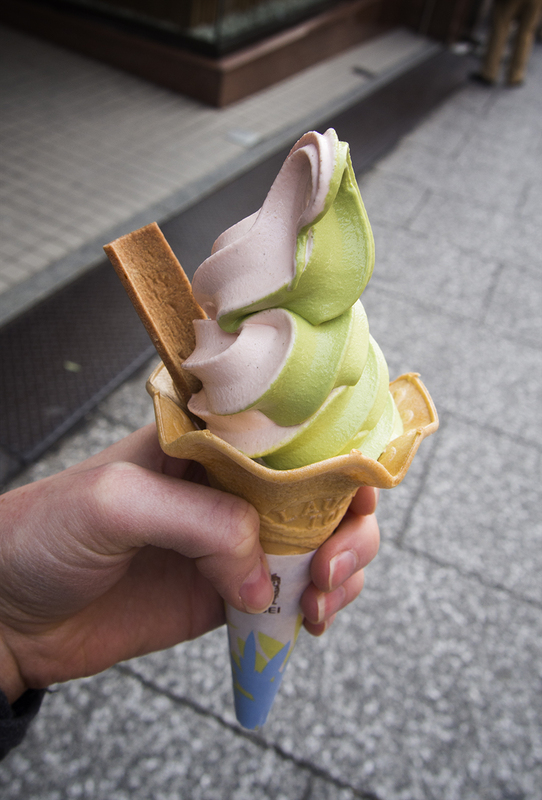 After that, I still had room for ice cream, so I got a sakura and matcha softcream, which was so amazing! I love matcha, but I had never had sakura before. It was so good! There was a little sweet biscuit kind of thing in it, which I used like a spoon, and then ate at the end. 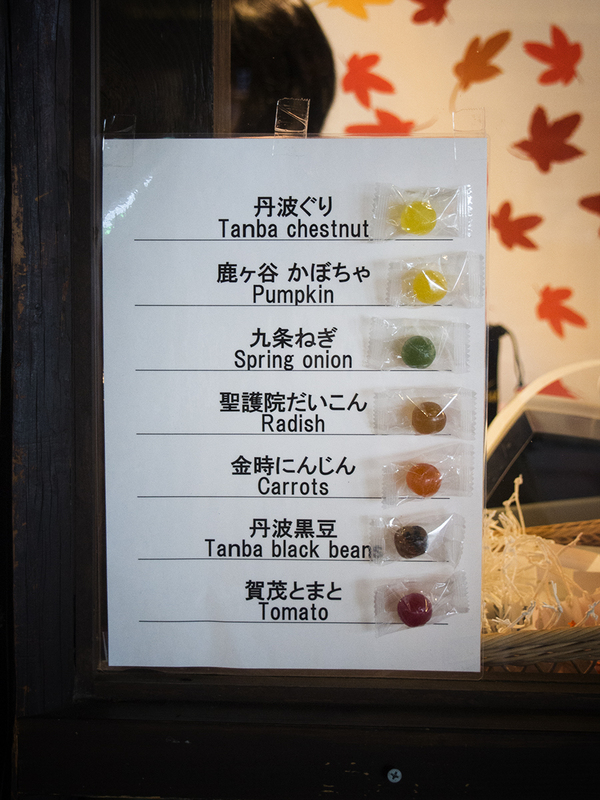 I’d seen lots of street vendors making these, so I think they are a famous treat in Kyoto. It was really really sweet, and hard. 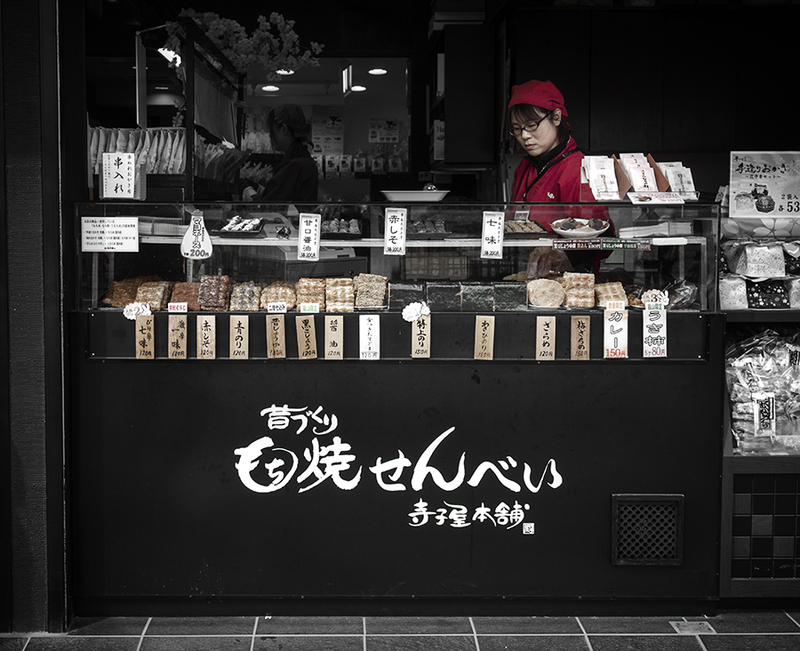 There were also a lot of shops making and selling yatsuhashi, which is a famous traditional sweet in Kyoto. 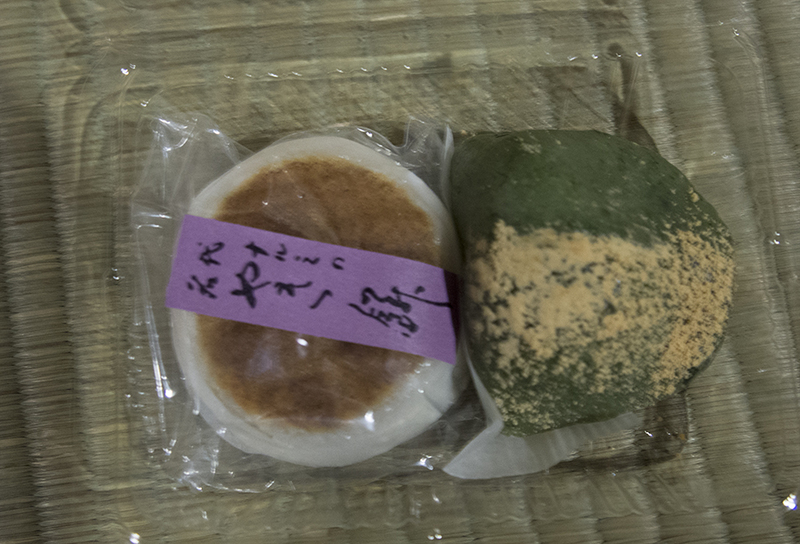 It’s made out of mochi, and filled with a paste that is usually anko. 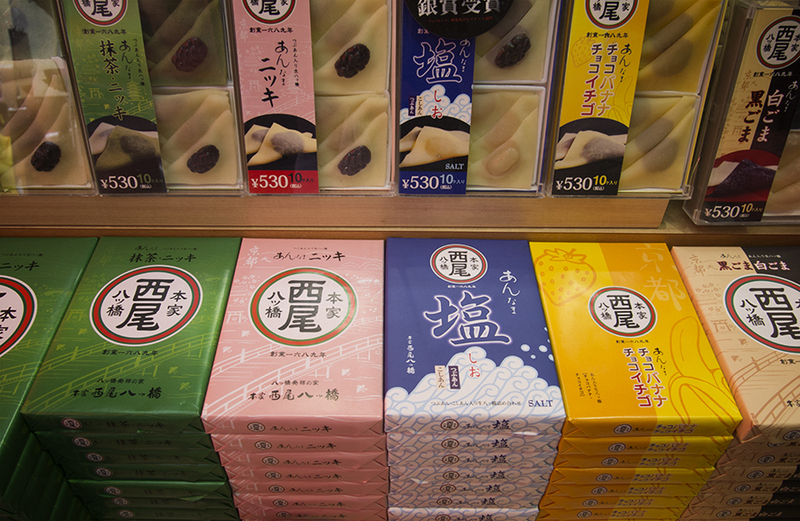 There are lots of different kinds, including sakura, matcha, black and white sesame, and salt. A lot of the shops had free samples, and some gave you a free cup of green tea to drink whilst you ate as many free samples as you wanted. I tried lots of different ones, including a banana chocolate one which was actually really good. My favourite was still the traditional anko ones though. After my ice cream treat, I wondered around the street a little more, and bought some gifts for people back home. 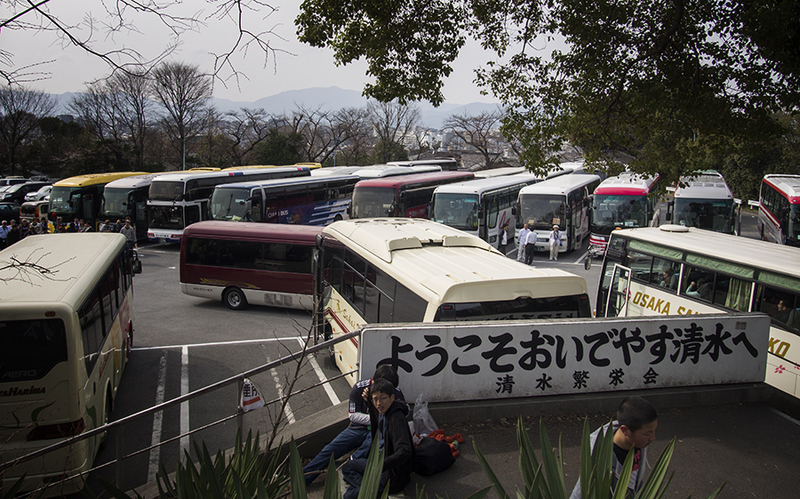 More bus-loads of tourists were arriving, and I even found this whole car park that was packed full of tour busses. There were tour guides everywhere, carrying sticks with little flags on top (or stuffed toy Hello Kitty dolls, for the fancier tours.) It reminded me of my first ever trip to Kyoto, when I went on a 3 hour tour like that and hated every minute of it. 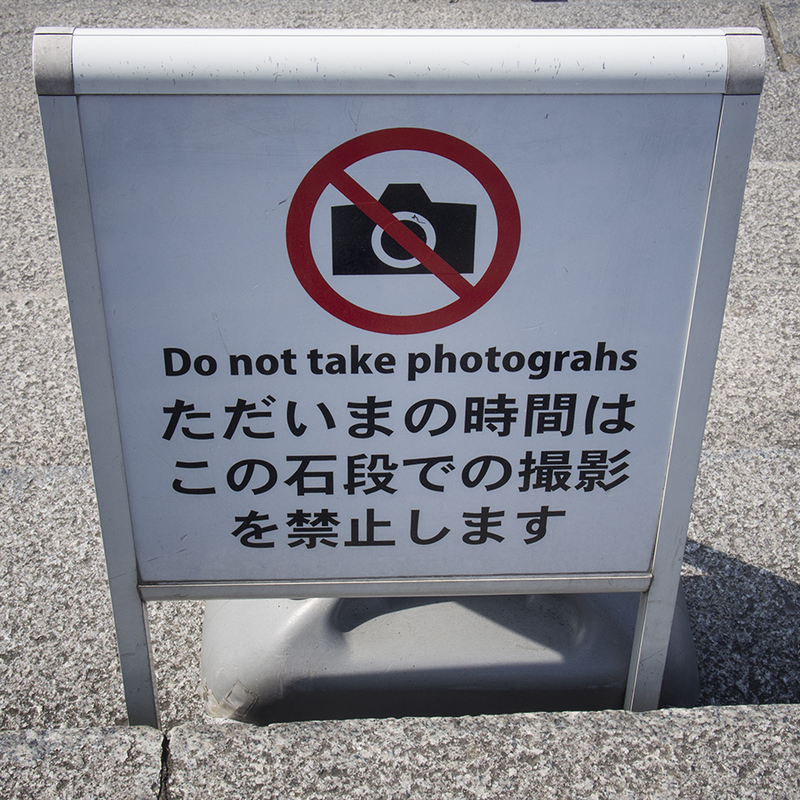 I don’t like being a tourist. I walked back to where I parked my bike, and felt a little relieved to find it still there and still in one piece. Then I walked it down along the street because there were still way too many people there to be able to ride without killing anyone. 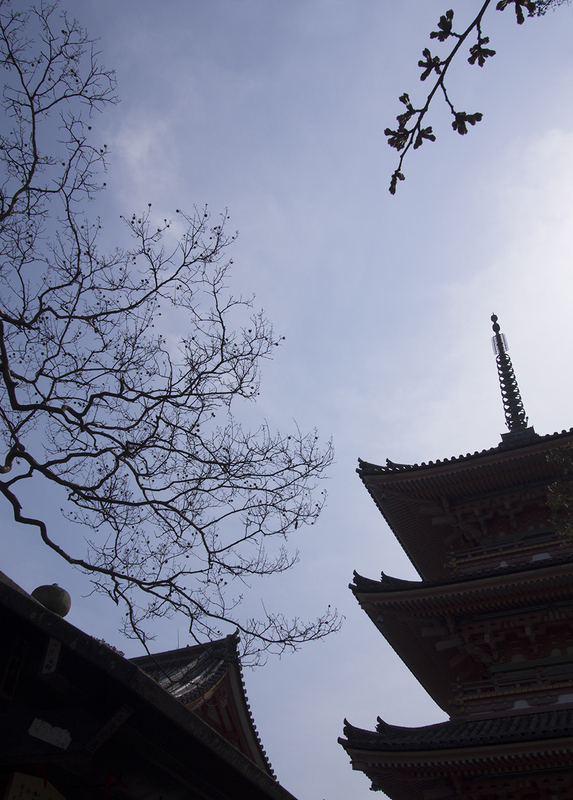 I walked away from Kiyomizu, towards Gion, and then stopped at a street map to decided where to go next. 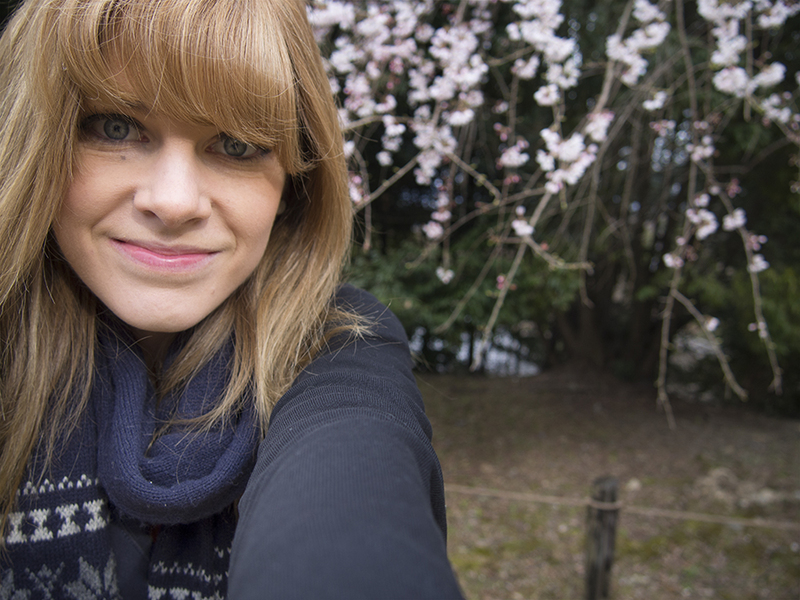 After studying it a little, I decided to head towards the big park in Gion to do a bit of exploring. That’s when I was ambushed by a Japanese boy. He asked if I needed help going somewhere, and I told him I was ok and I wasn’t lost. But he kept asking where I wanted to go and if he could show me the way. I knew this was going to turn into one of those ‘show the gaijin around for a million hours and latch on’ situations, so I said it was ok, I was going to Gion and I could get there myself. But he insisted on showing me the shortcut, so I had no choice but to follow him. We rode to the maiko street of Gion, and that’s when I knew I had to change tactics and ditch him. I had thought about pulling a sneaky left when he was riding in front of me, and speeding away down back streets on my flimsy purple bike. But of course we all know by now that I am a sucker for being nice to people, and I can’t bring myself to ditch them. 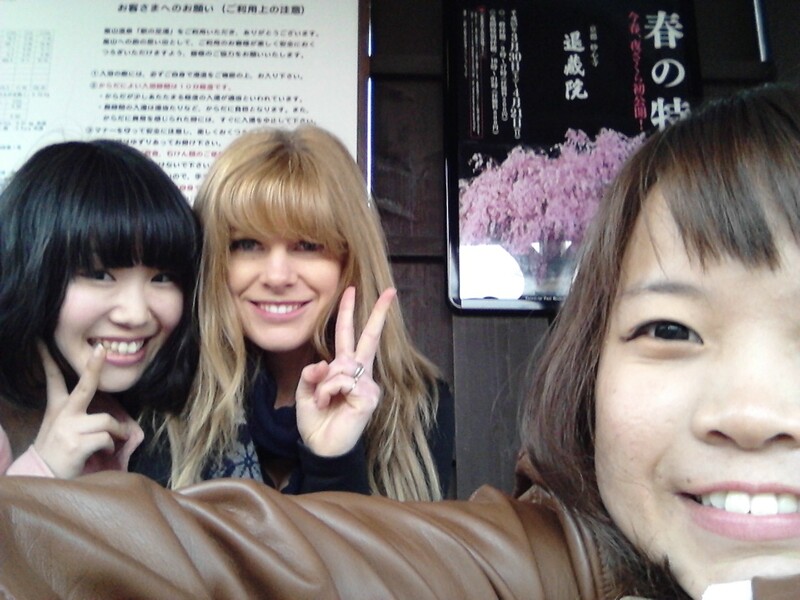 So when we got to Gion, I pretended I had to meet a friend in 20 minutes, so I had to go. I don’t know if he bought it or not, but he asked if we could meet up another day. Oh no, the clingy type. I said that unfortunately I was leaving Kyoto tomorrow, and he bought it. Then I was finally free. I rode up to Maruyama park, then tried to find somewhere to leave my bike so I could explore on foot. This is the one downside of a bike in Kyoto- you can’t just park it anywhere. There are signs everywhere saying that if you leave your bike, it will be taken away and you’ll have to pay to get it back. So I walked around for ages with this darn bike, trying to find somewhere to leave it. I even saw two maiko in the full kimono and makeup, and I couldn’t even chase after them for a sneaky photo because I had to wheel the bike! I took it through the park and through a shrine (which I later found out was not allowed, but the sign that said ‘no bikes’ had fallen down at the entrance I went through.) There was a little collection of bikes parked at the entrance, so I thought that maybe it would be ok to leave mine there too. There weren’t any ‘no bike parking’ signs, at least. 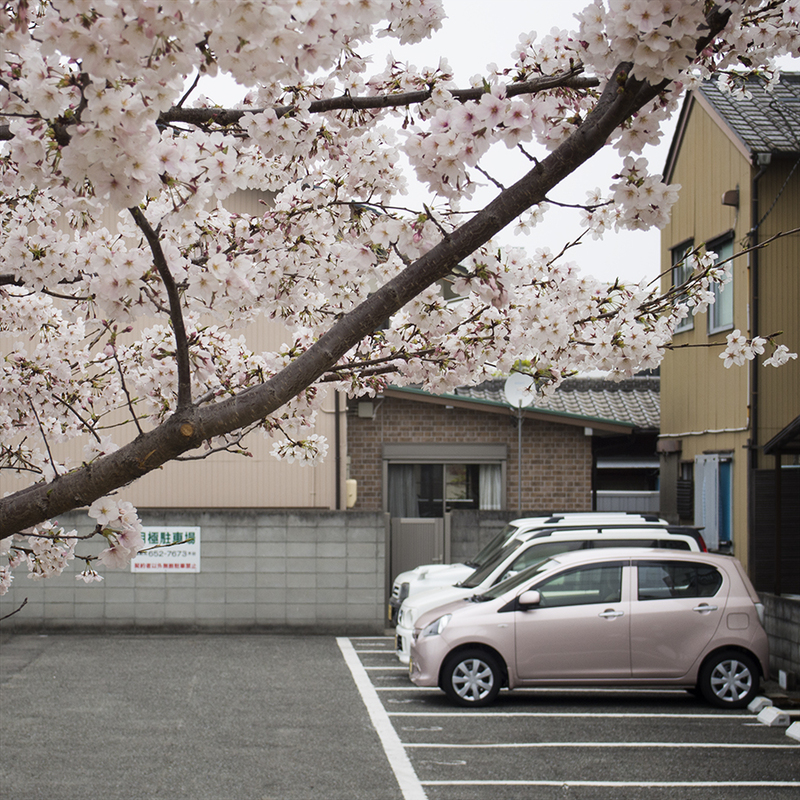 So then I was able to properly looks around the shrine and park, which were both dotted with cherry blossoms, and were so pretty! I did a quick circuit of the shrine, but it was full of visitors, so I moved on to the park pretty quickly. I spent ages exploring the park, walling around the carp-filled ponds and checking out the little stalls selling ice cream and takoyaki. 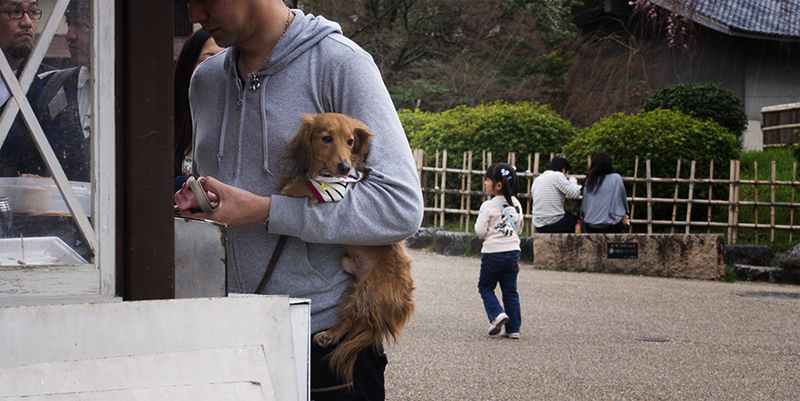 There were people having picnics everywhere, with the most popular spots located underneath the sakura. In one area, lights and decorative lanterns were strung up between the trees, and blue plastic tarps were laid out on the ground. I could just imagine how packed they are going to be when the blossoms are in full bloom. 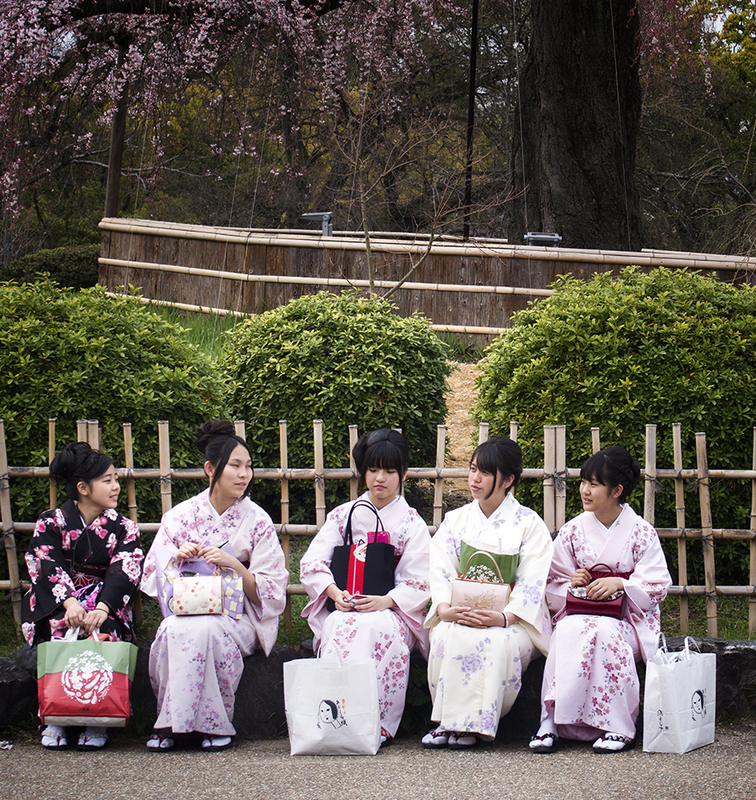 Japanese love their hanami, which is the term for viewing cherry blossoms. Everyone gathers to have picnics and get drunk under the flowering trees. I wish I could be in Japan with friends to experience this. At least once, so I could see what the hype is about first hand. I’m sure it’s an amazing sight. 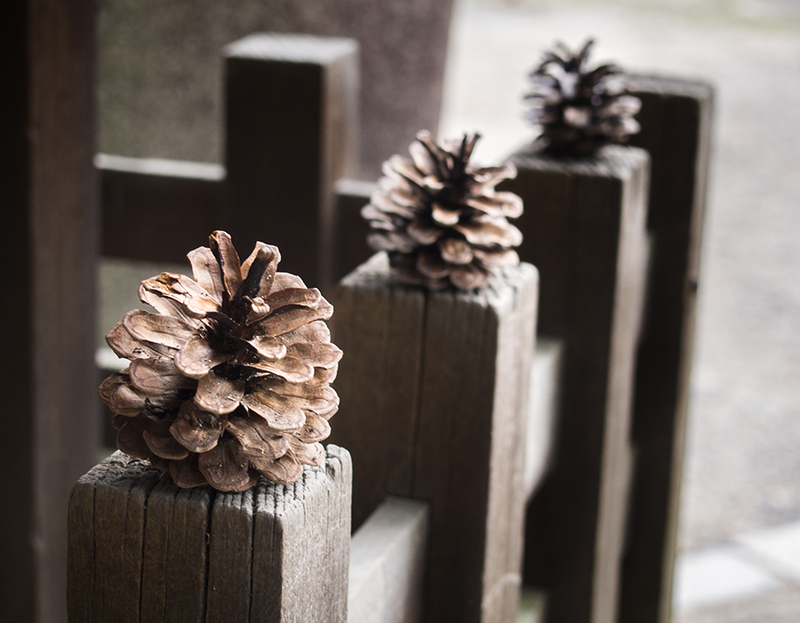 After wandering around the park, I headed south and looked at a few temple grounds. 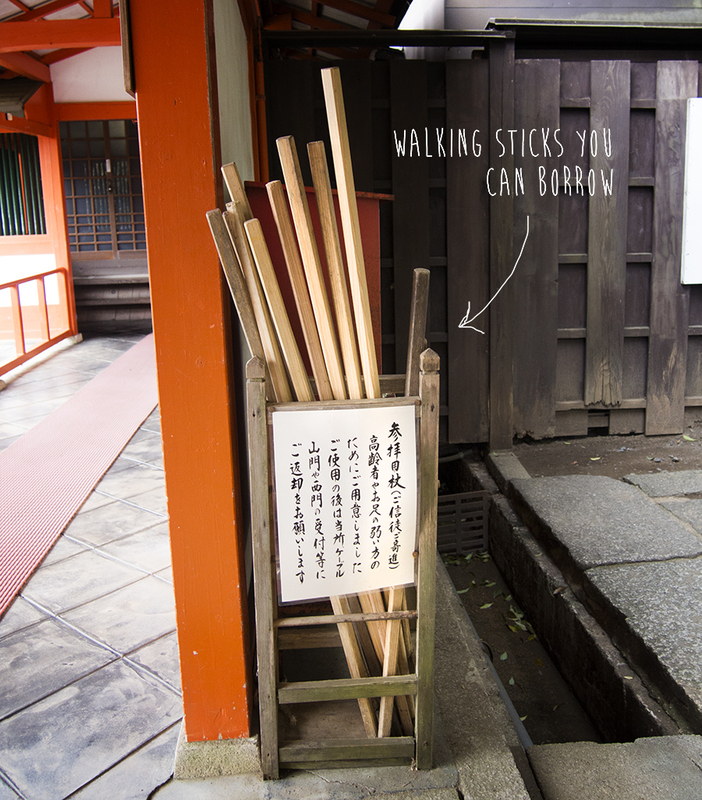 I wasn’t really interested in the temples themselves, but I love the old back streets of Kyoto, and I wanted to fill up a few memory cards with pictures. I love the old style walls, and building facades, as well as the cobblestone paths. 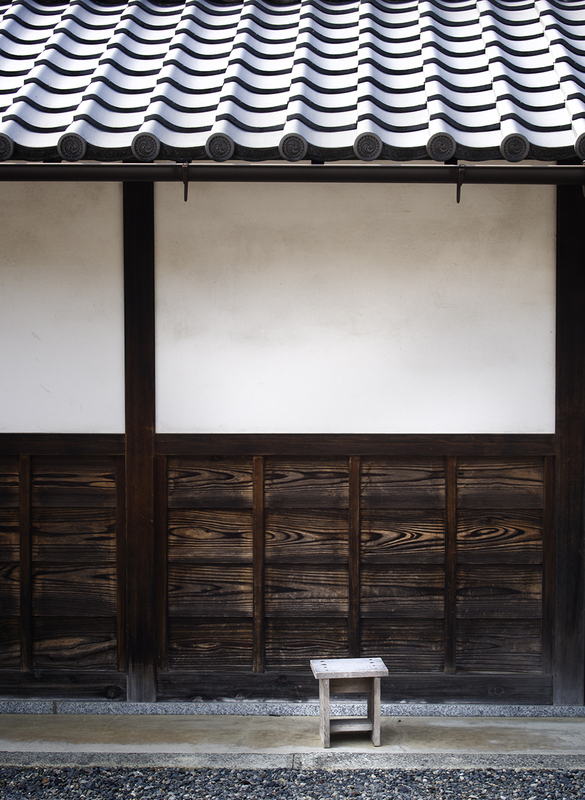 You can occasionally see into a residence or a tiny garden, getting a glimpse of the simplicity and serenity of a well manicured garden. There were a lot of people out wondering, being Sunday and all, including a bunch of school girls who were singing a ‘Video Killed The Radio Star’ harmony at the top of their voices. They particularly liked the ‘oo-wahh-oouuww’ bit. It was pretty funny. After a bit more exploring, I returned to my bike, which I was relieved to find was still where I left it (and sans parking fine.) I didn’t really want to return home yet, so i cycled around some small streets, heading north again. 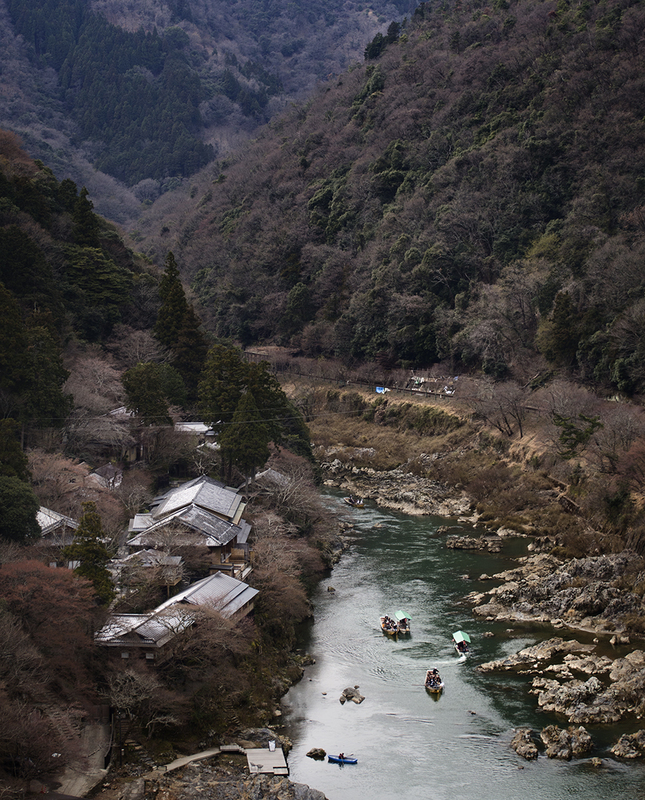 Eventually I came to the big river that runs right through Kyoto. I cycled along this river for about 20 minutes, which was great because there was a path along the river banks, so I didn’t have to stop for traffic lights or pedestrians. It was getting really cold, and the mountains were starting to turn a deep blue against the sky. 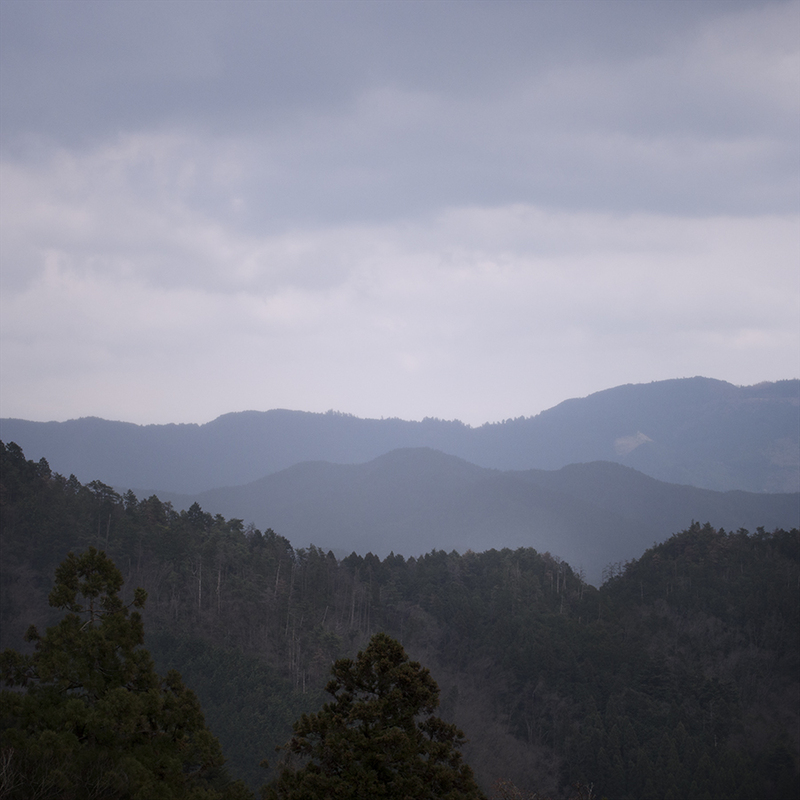 I could see the character 大 (“big”) on the side of one of the distant mountains. Every year, this character is lit on fire for a holiday called Obon. I think it would be amazing seeing this giant burning kanji in the hills. I cycled home really quickly, passing the Imperial Palace grounds on the way. 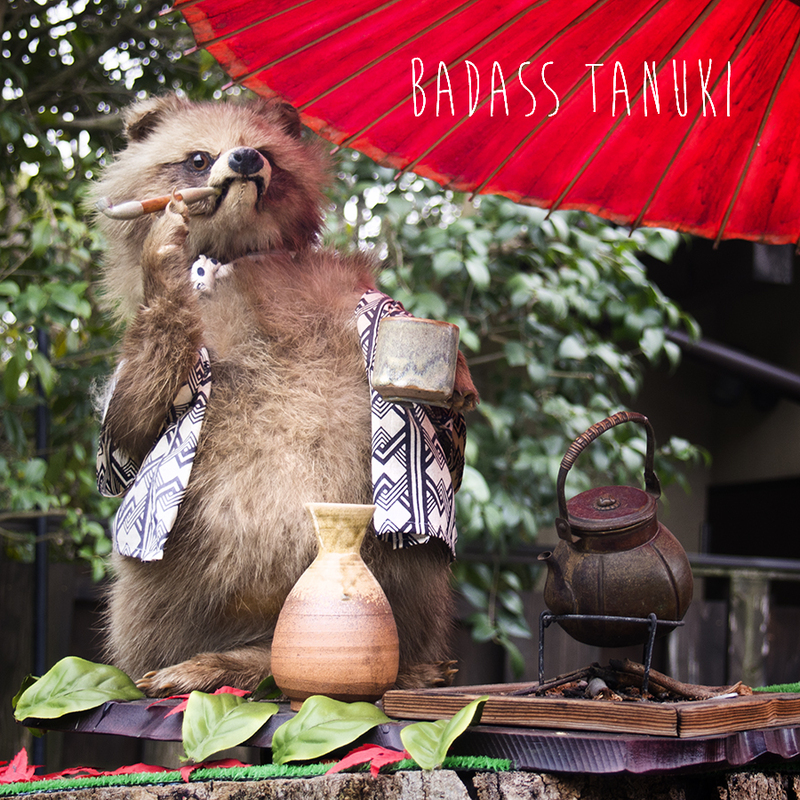 I also saw something in a bush, and got all excited because I thought it was a tanuki, but I think it was just a bird or something. I got home around 6:30, in time for the takoyaki party, which would start at 7. 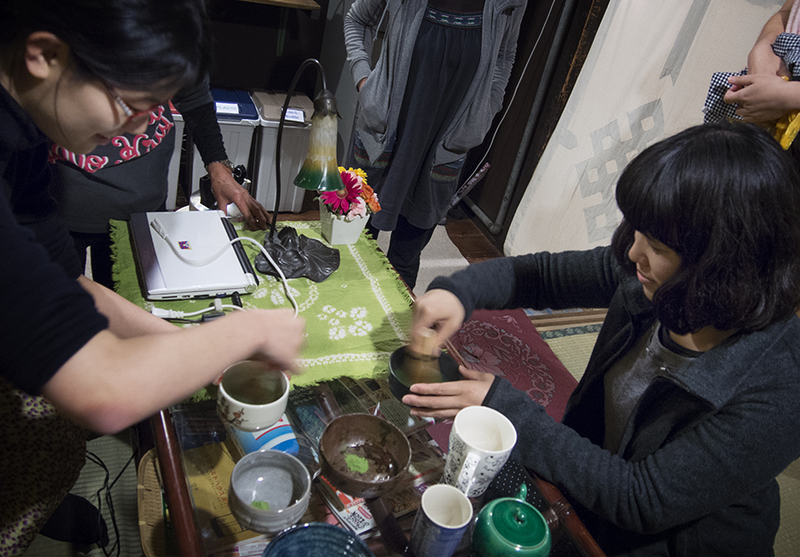 The Mundo staff where busy rearranging the living room, and setting up the little takoyaki machine, in preparation. 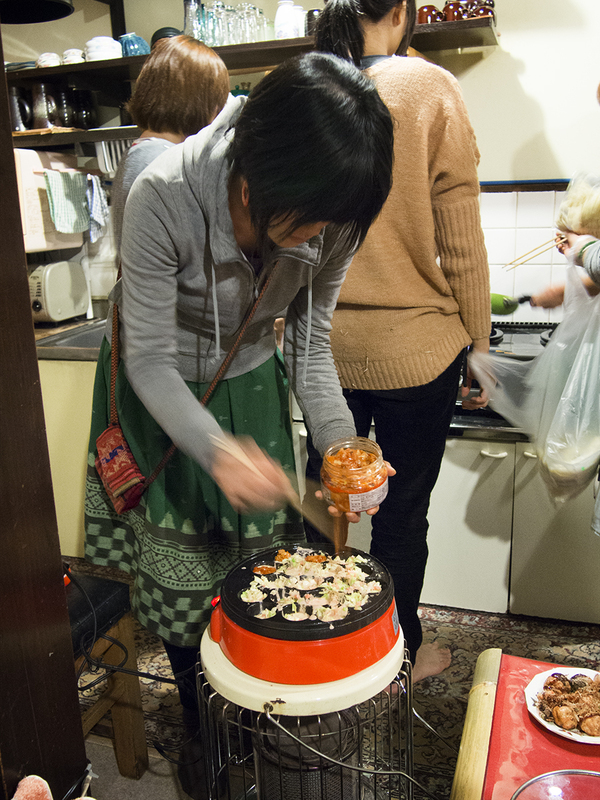 The party was to celebrate the last day for one of the staff, S. As everyone started arriving home, we began cooking. 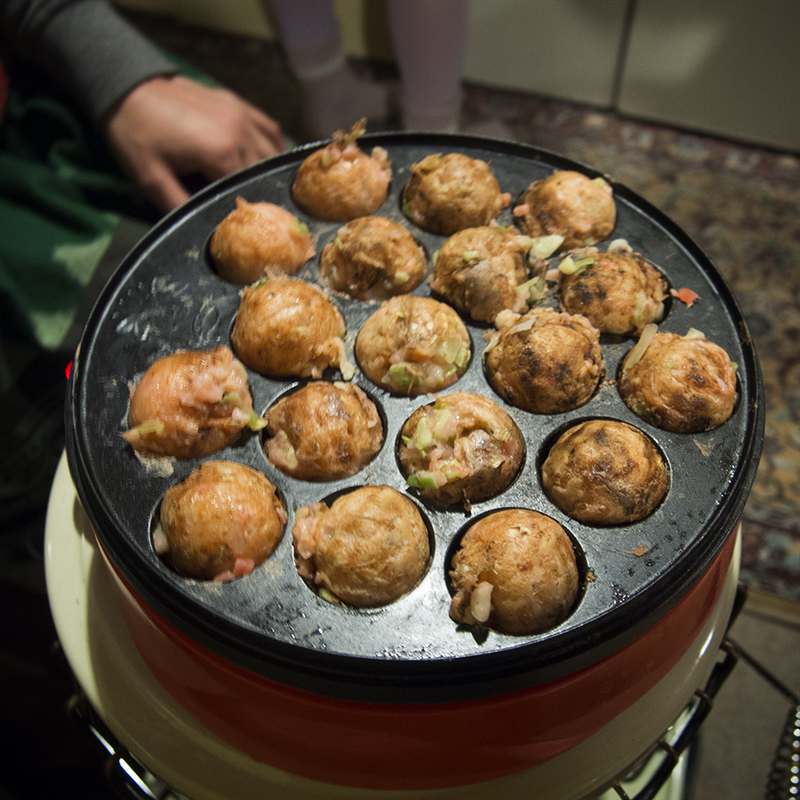 Midori poured batter into the takoyaki machine and began cooking the little balls, and some yaki udon was being prepared over near the stove. Everyone helped, chopping vegetables, frying noodles, and chatting and enjoying themselves. We made lots of different kinds of takoyaki, including cheese and kimchi (together), plain octopus, and mini sausage with cheese. 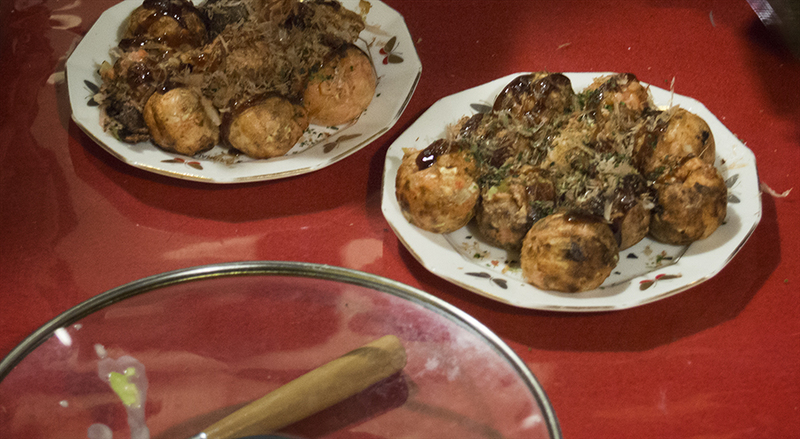 We topped them with takoyaki sauce, bonito flakes, kewpie, and spring onion. 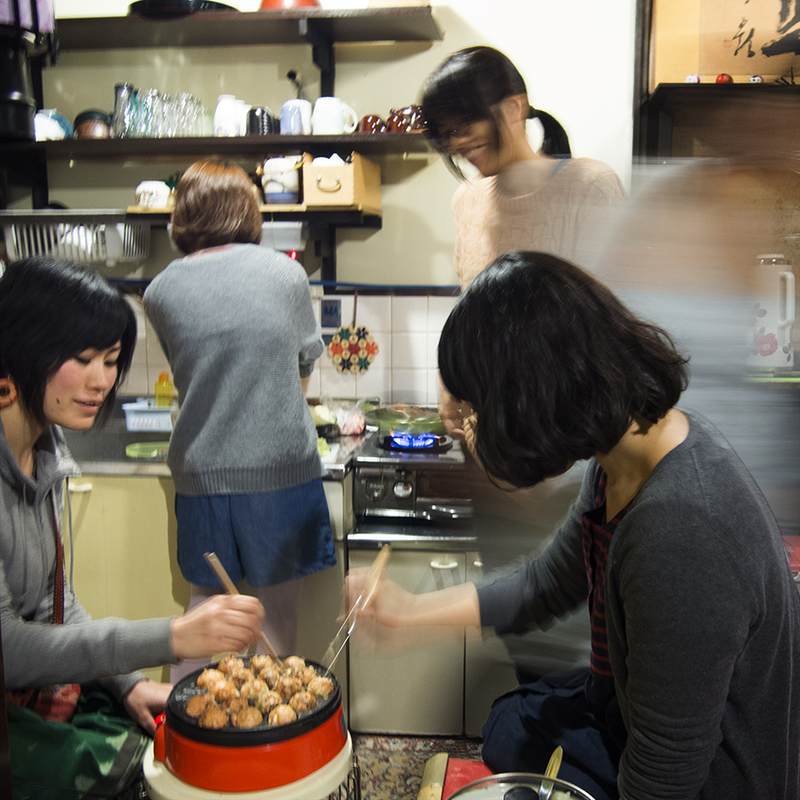 Everyone sat around the little table and ate together, and there was always one person manning the takoyaki machine, so fresh batches of the tasty little balls kept appearing. More people kept arriving, and snacks and drinks were shared around. I ate so many takoyaki, but the best kind were the ones with kimchi inside. I also ate pretty much a while bowl of vegetables by myself, because even just the fried vegetable was delicious. 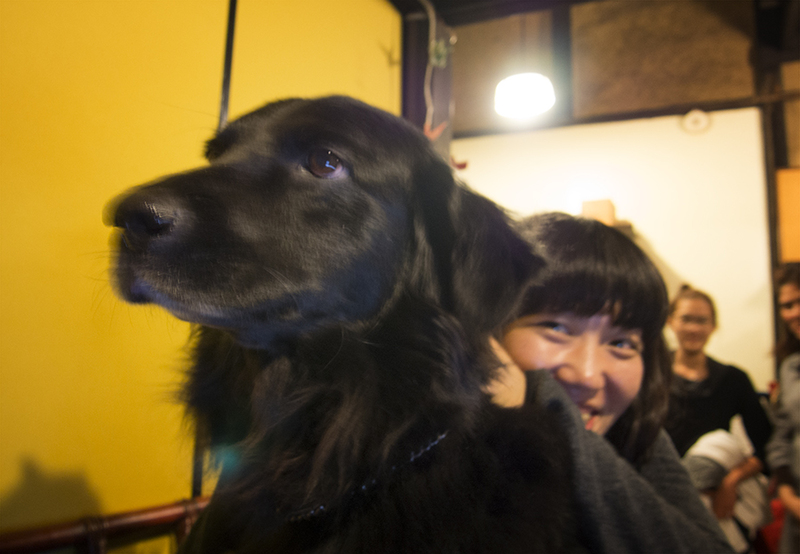 After we had been eating for a while, the door slid open and a black dog came in. 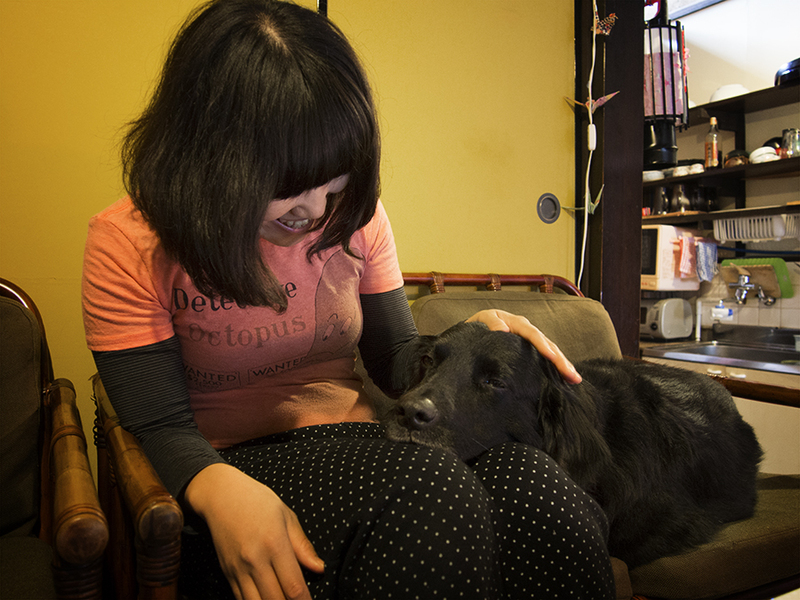 It was the hostel’s dog, who had been away for a few days but was returning home! 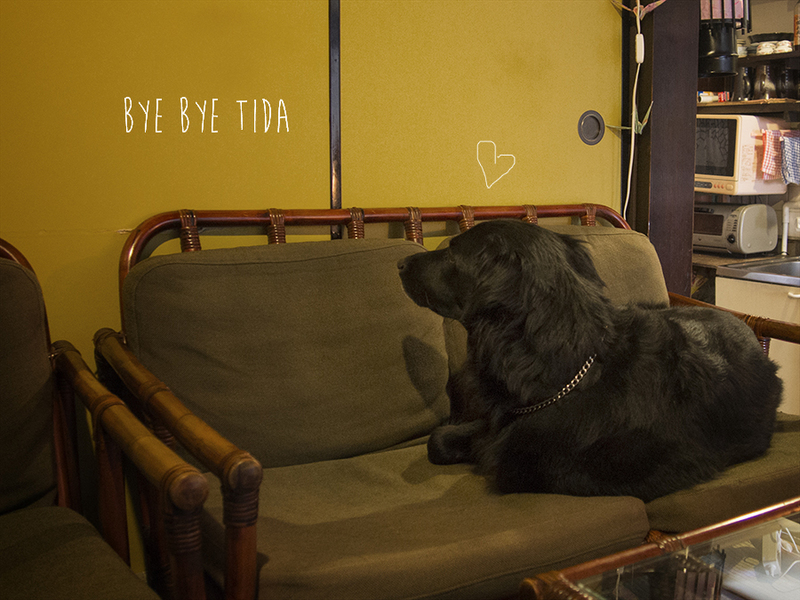 His name is Tida and he is a black labrador. He is so cute and funny and everyone fell in love with him instantly and just wanted to hug and pat him. He is so well-behaved, he would sit inches from food and not even try to eat it. 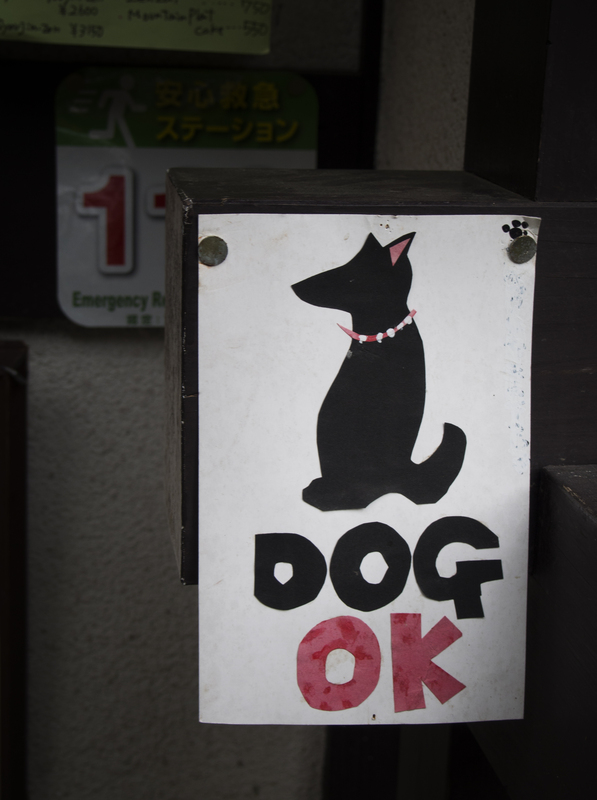 And he knows ‘sit’ in Japanese and English! I want to steal him and take him home. 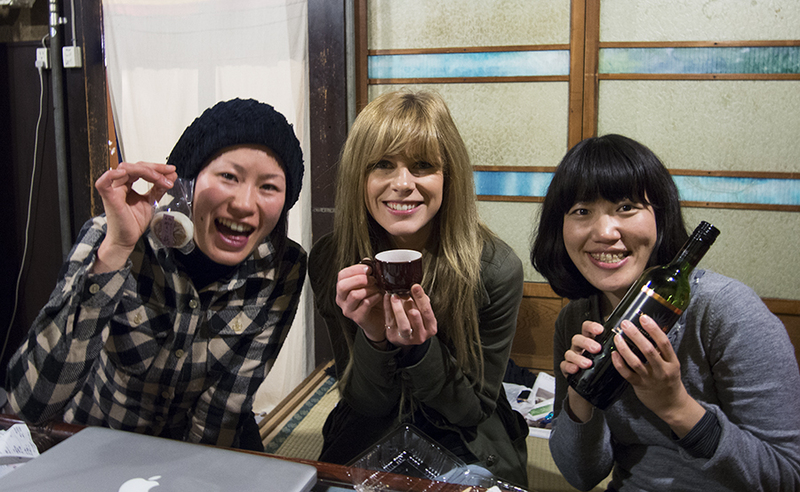 After dinner we passed around chocolates and a cheese cake, as well as wine and ume-shu, which is Japanese plum liquor. It’s really sweet, and easy to drink. Before long, it was time for S to leave, so we all said goodbye and wished her a safe trip to Kobe. I clipped a koala onto her scarf and then everyone spent the next ten minutes taking photos of it. Then S left for the overnight bus, and everyone went back inside. 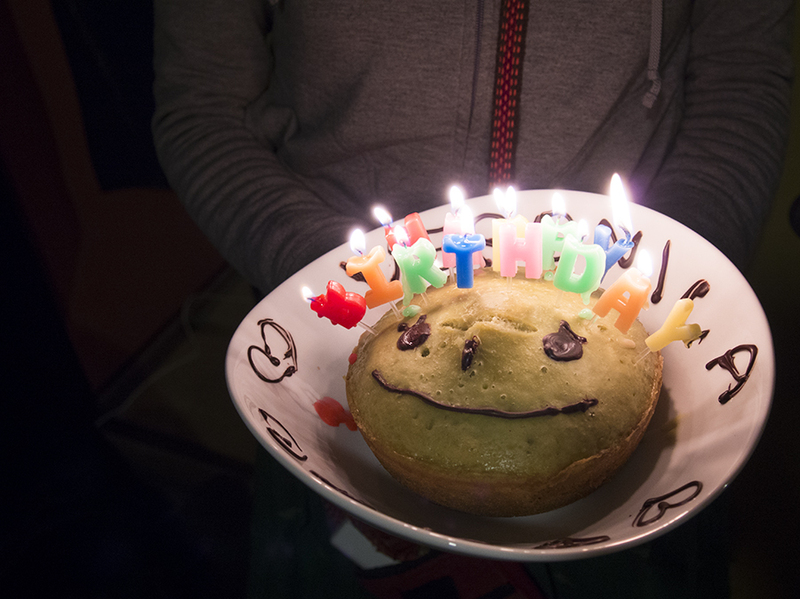 Later, some Italian girls who are also staying here came home, and Midori brought out a green tea cake that she had made in a rice cooker, because it was their birthday! We all sang happy birthday, and then ate the cake, which was really tasty. 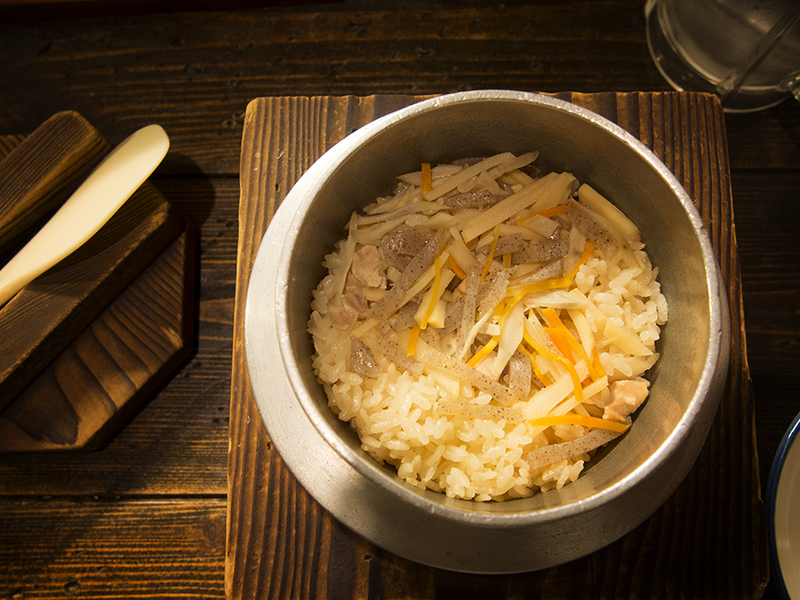 I can’t believe it was made in a rice cooker! 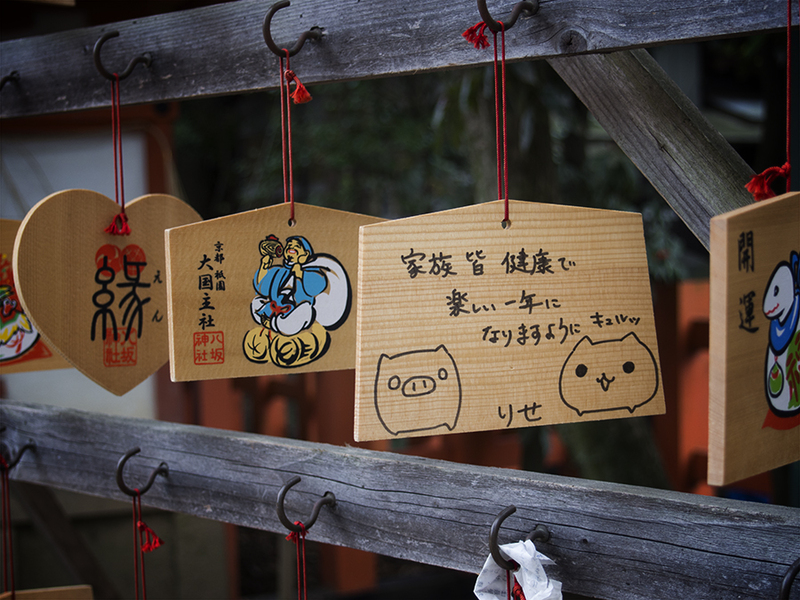 Here are a few more shots from Kiyomizu-dera. They are all ok to view like this, but the panorama really needs to be clicked bigger to be appreciated. Go on, do it, you know you want to!